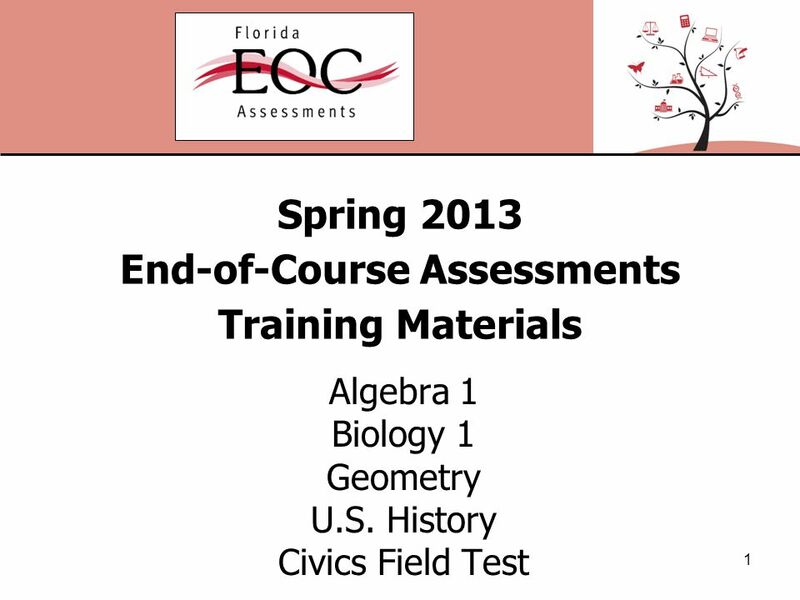 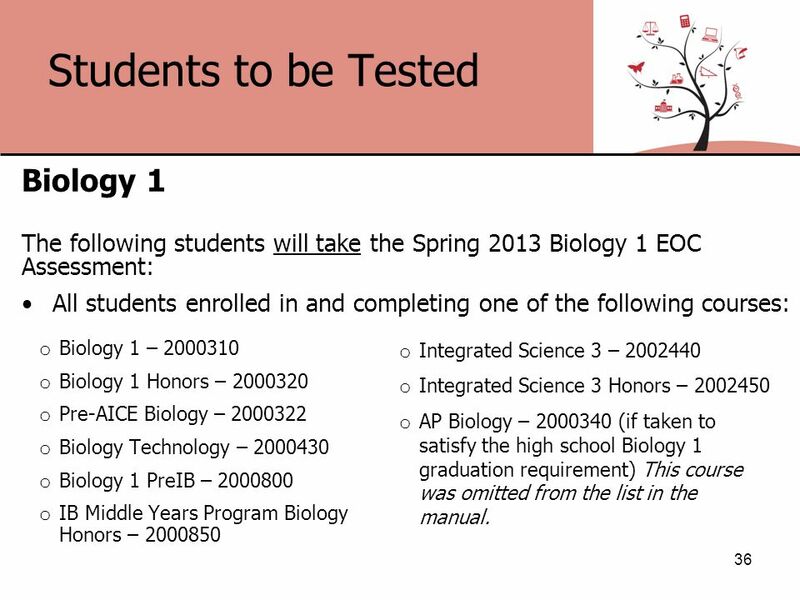 Spring 2013 End-of-Course Assessments Training Materials Algebra 1 Biology 1 Geometry U.S. History Civics Field Test 1. 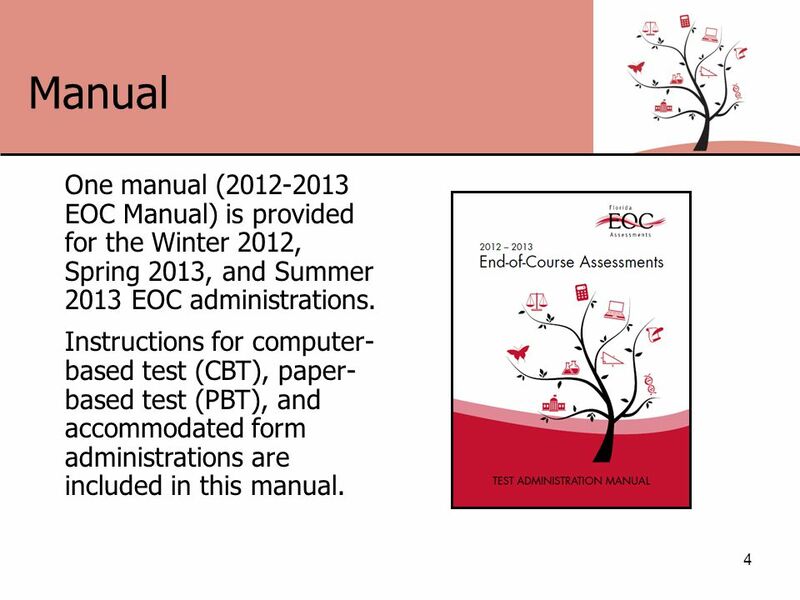 4 Manual 4 One manual (2012-2013 EOC Manual) is provided for the Winter 2012, Spring 2013, and Summer 2013 EOC administrations. 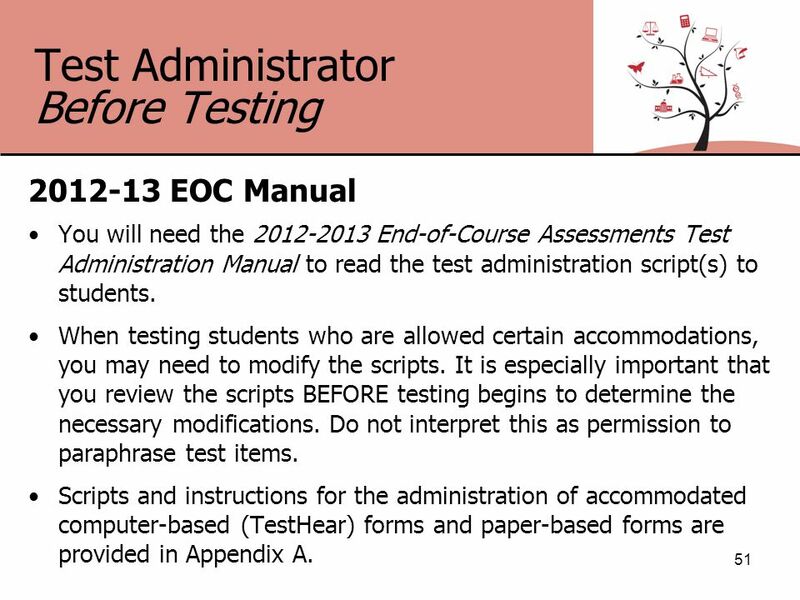 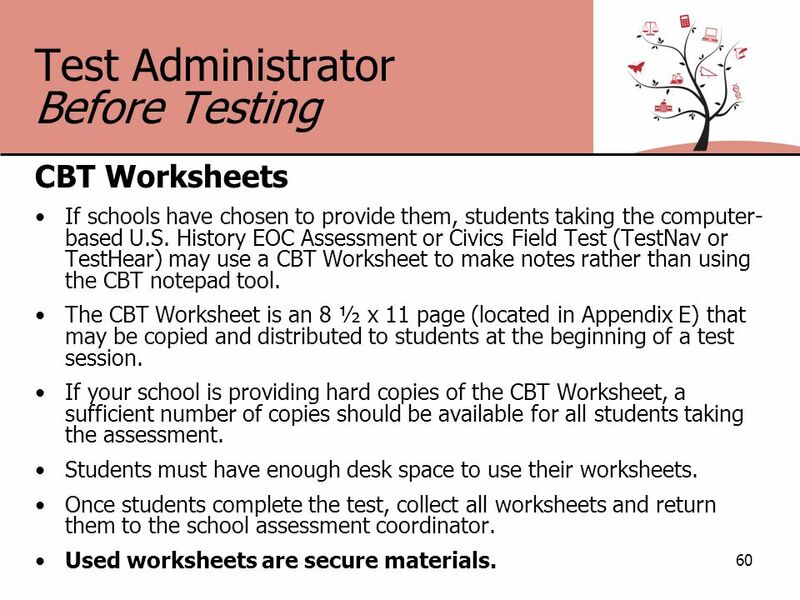 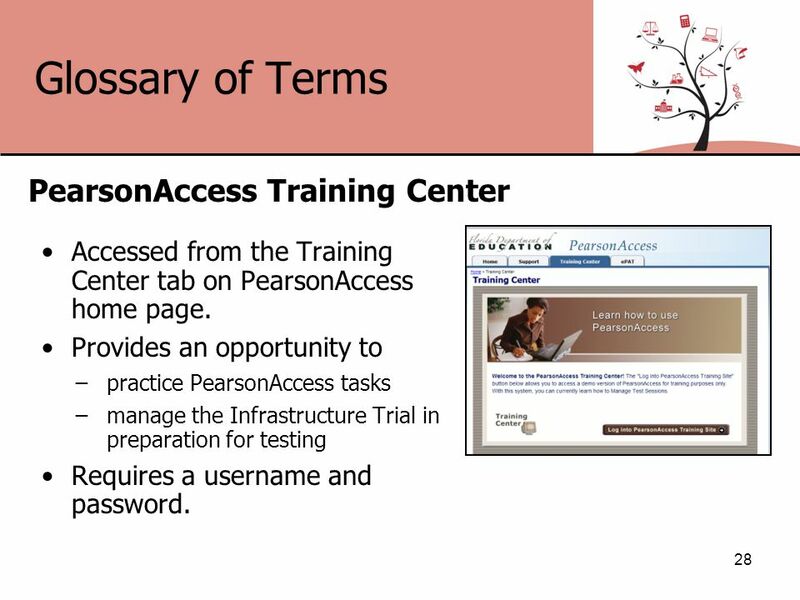 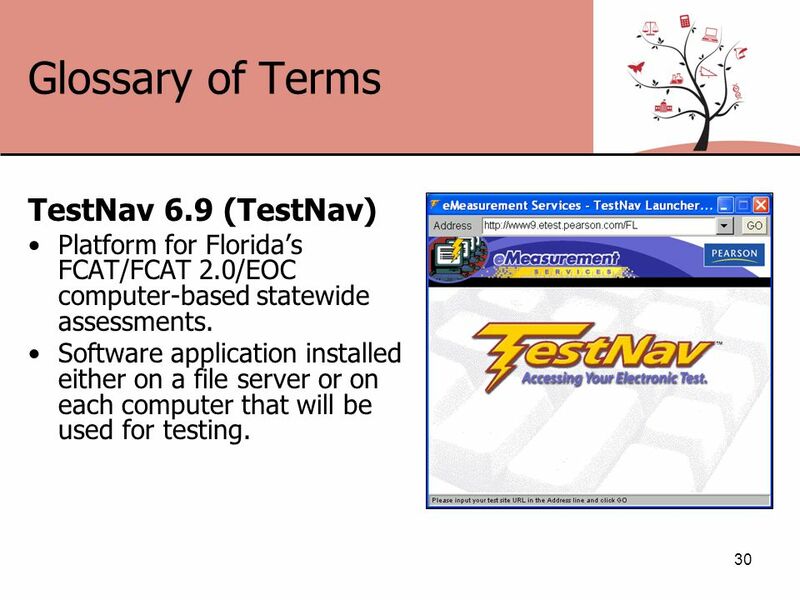 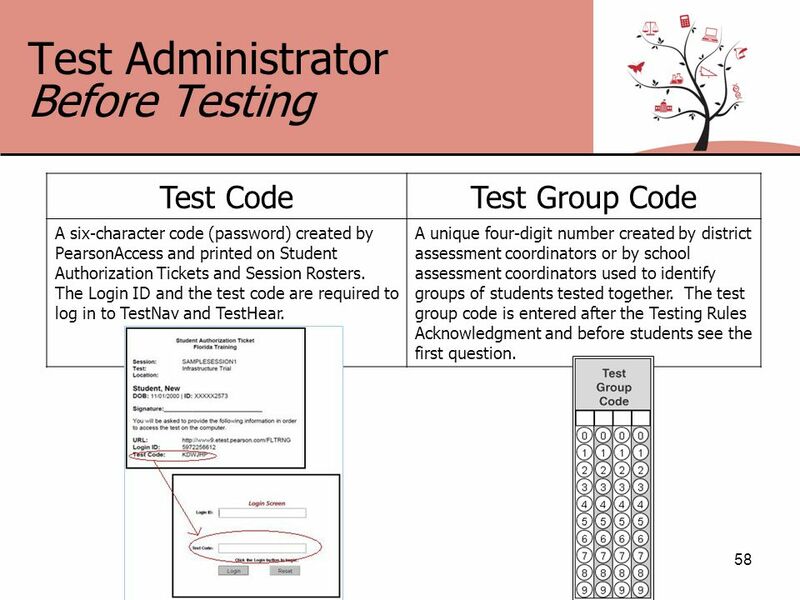 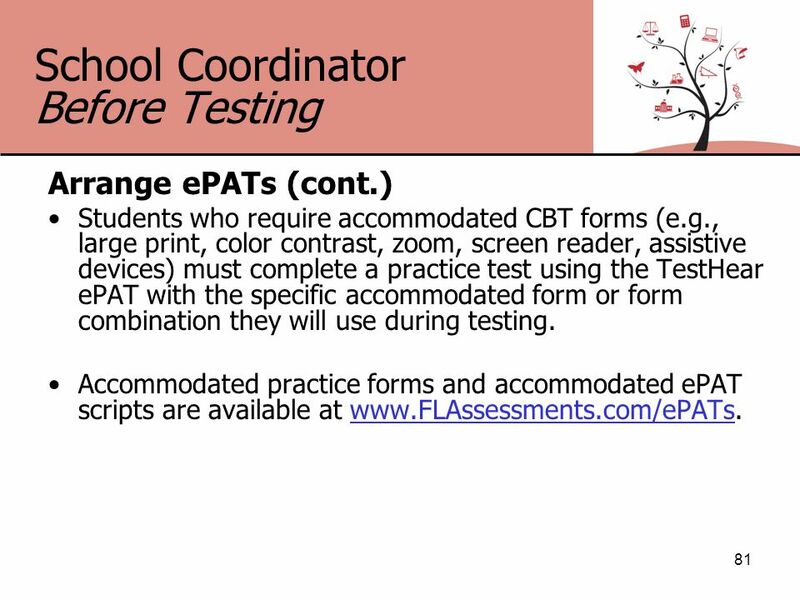 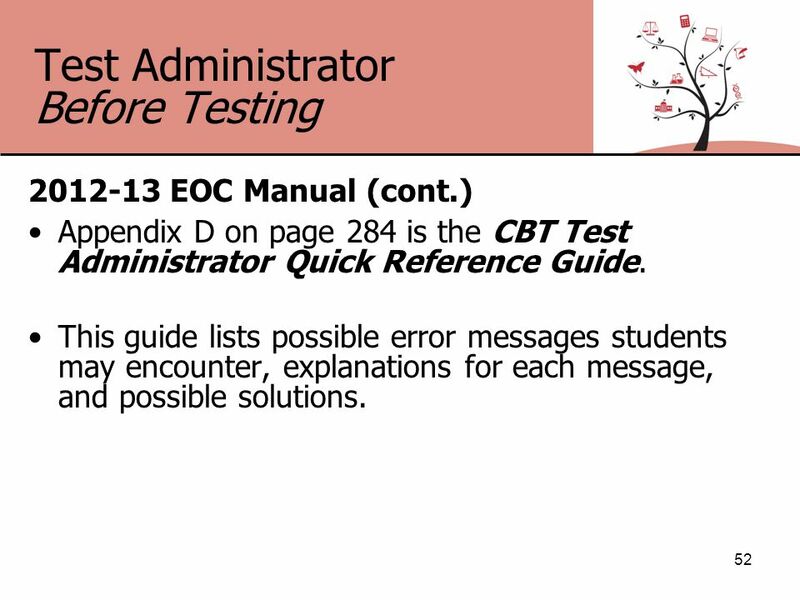 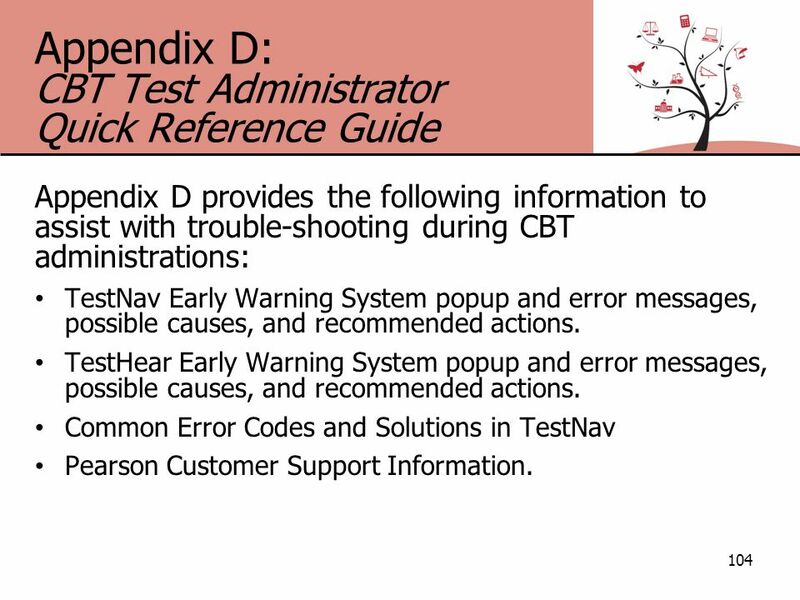 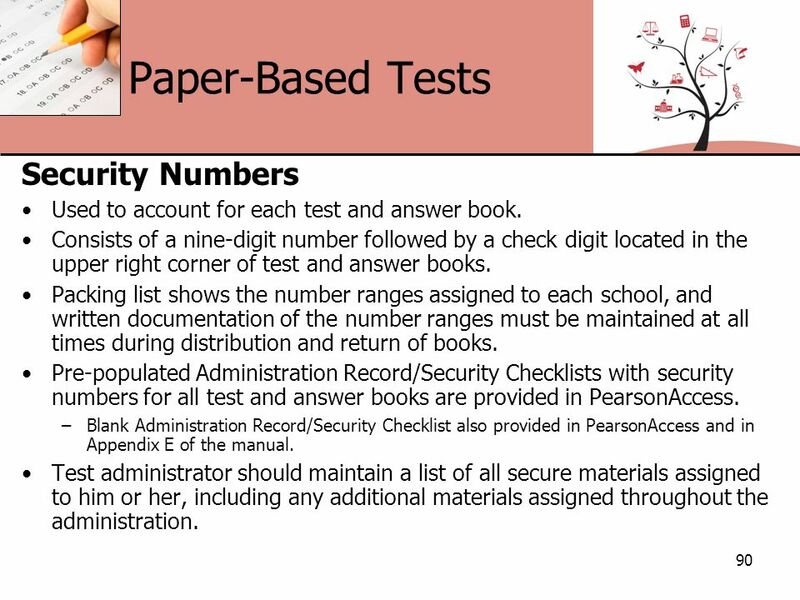 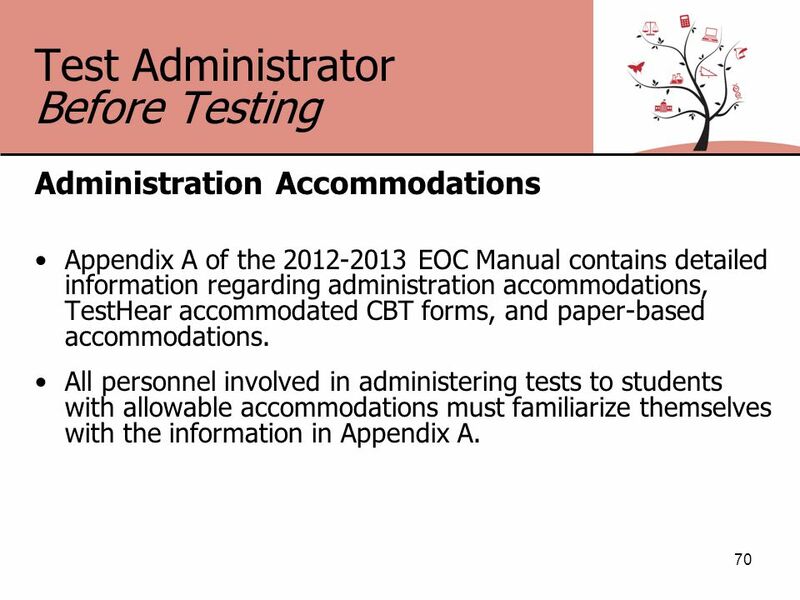 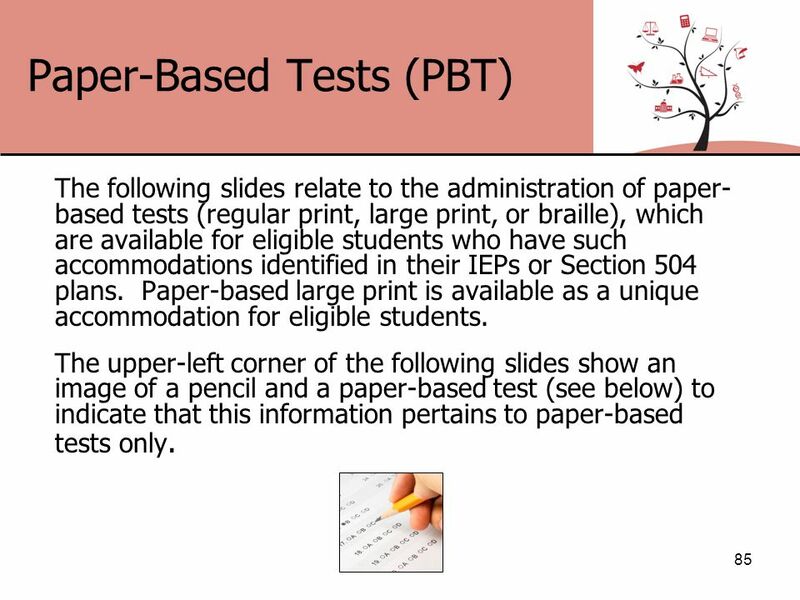 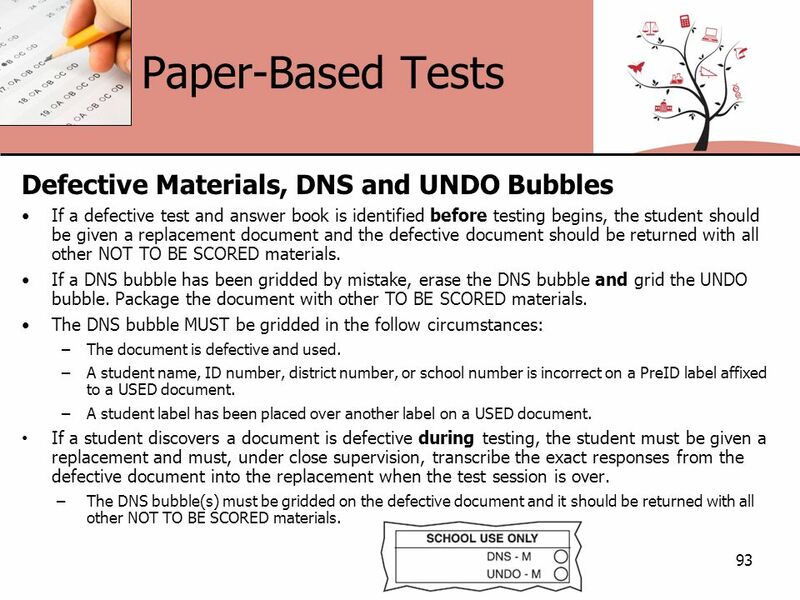 Instructions for computer- based test (CBT), paper- based test (PBT), and accommodated form administrations are included in this manual. 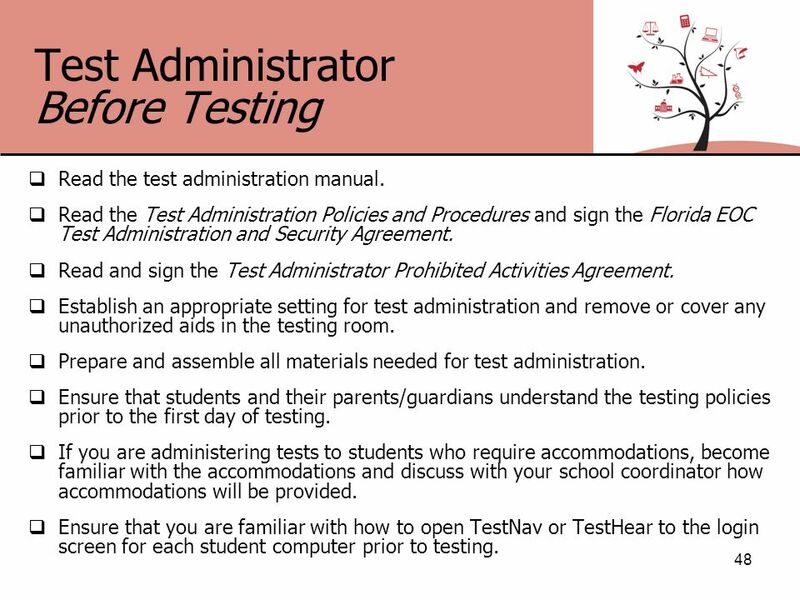 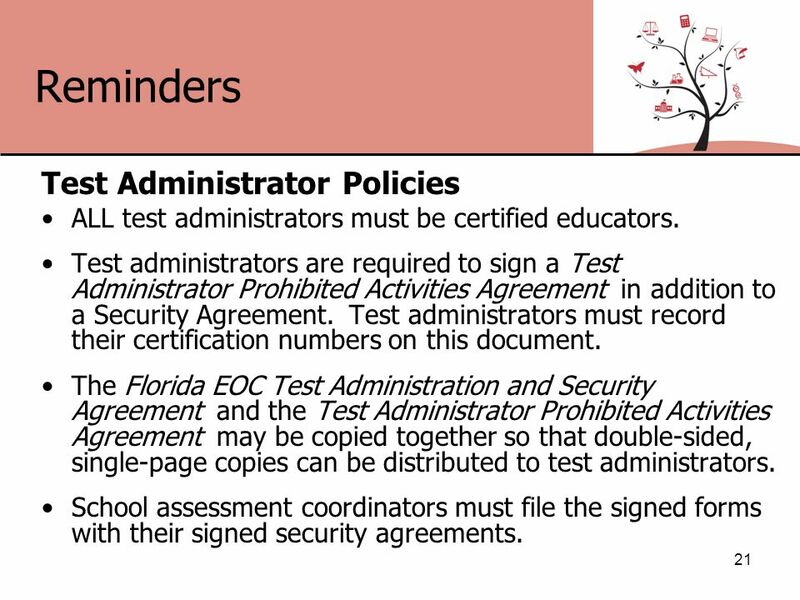 66 Test Administrator Before Testing Security Log 66 A Security Log must be maintained for each testing room. 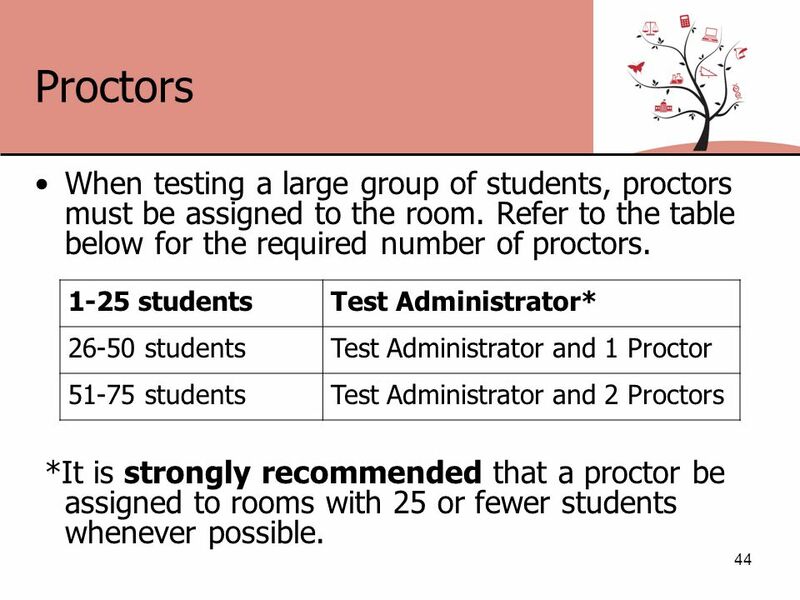 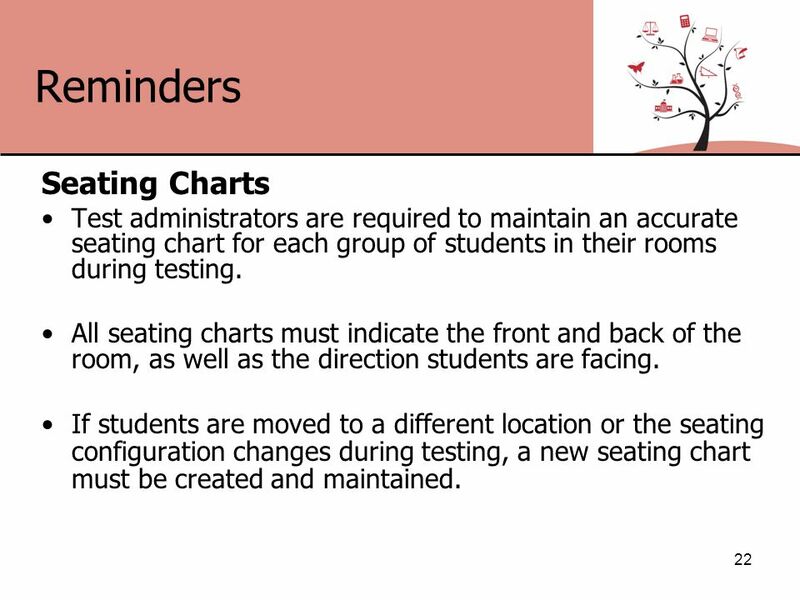 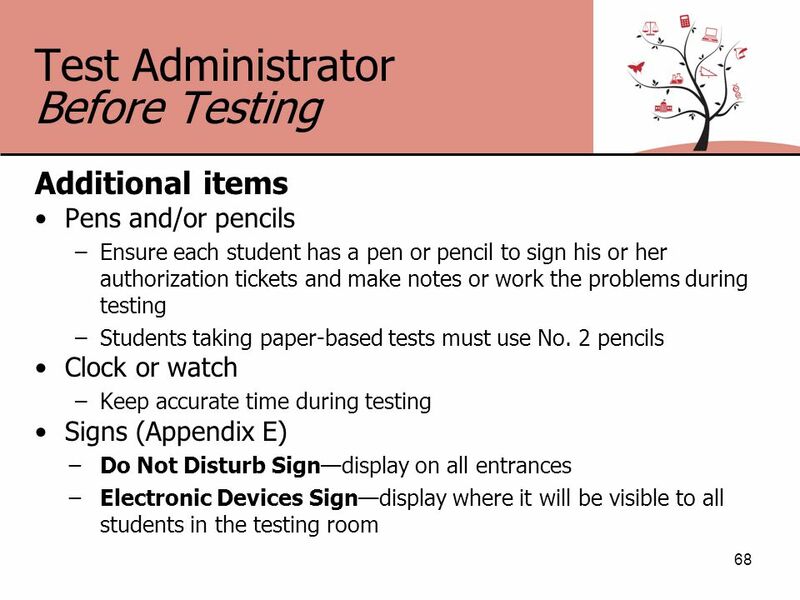 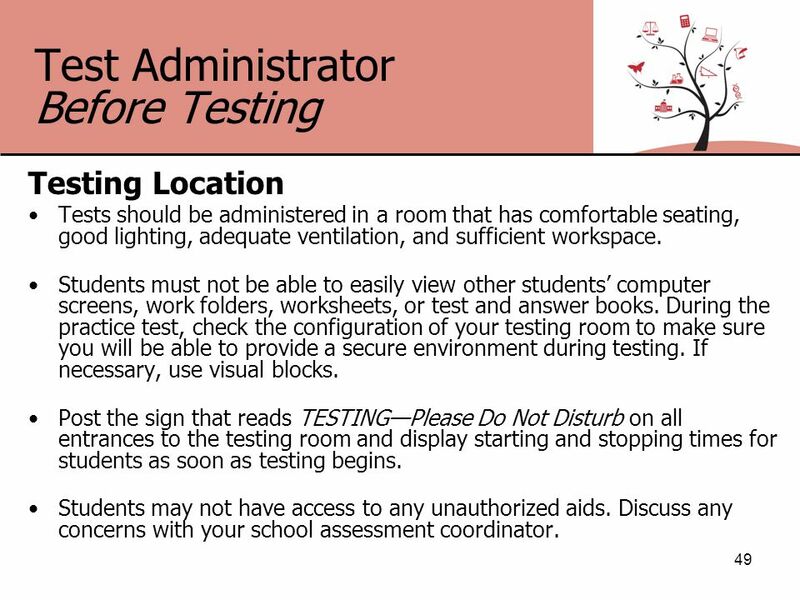 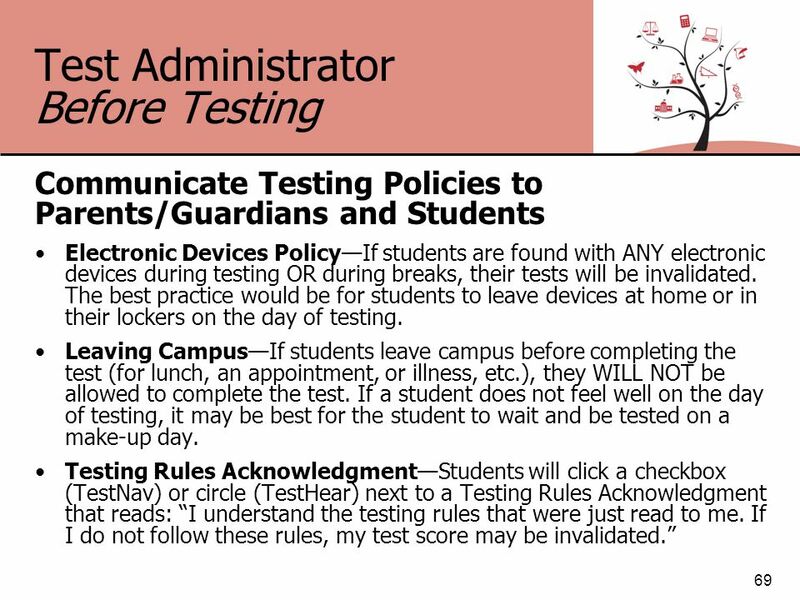 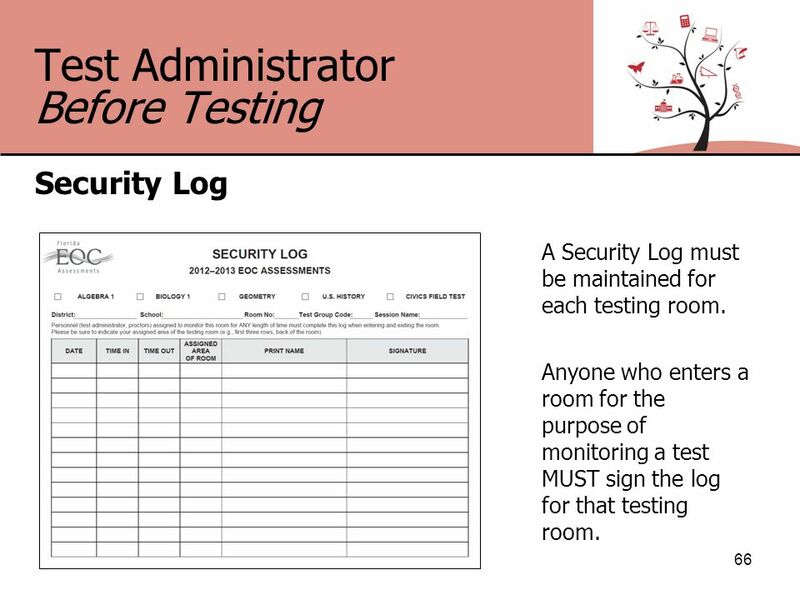 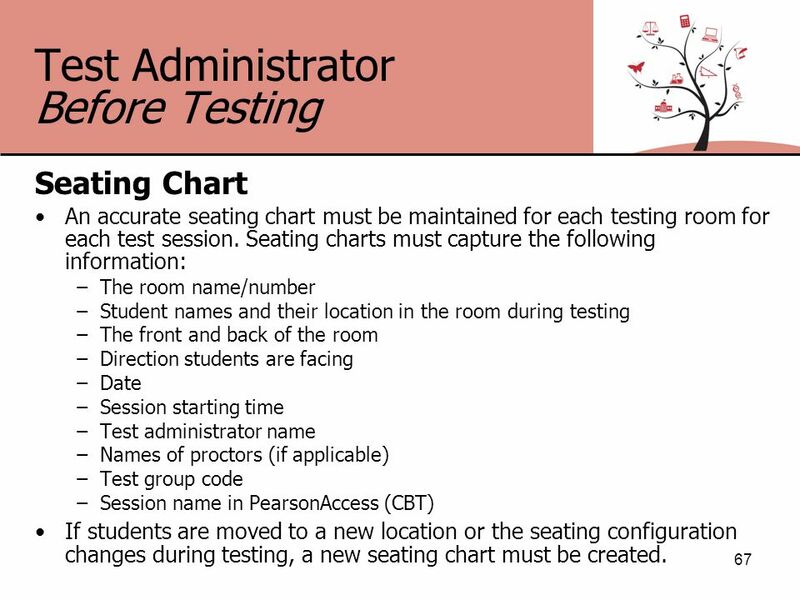 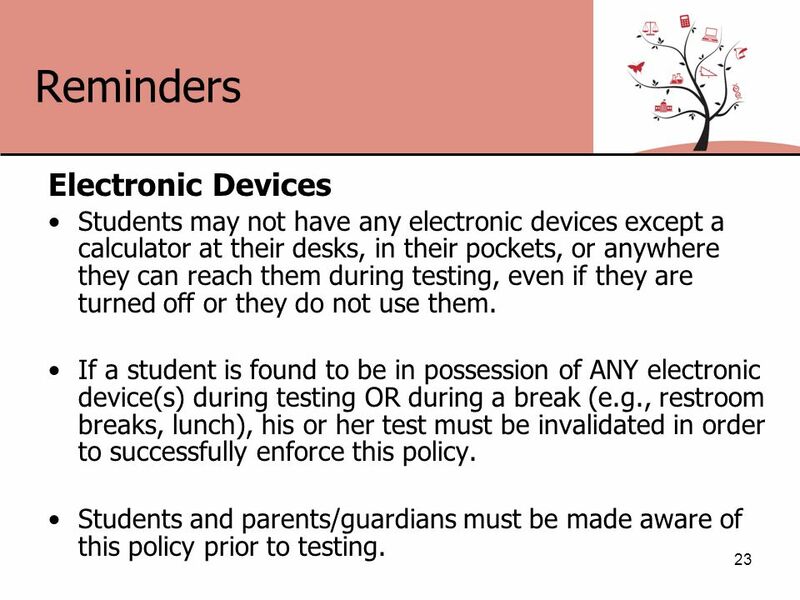 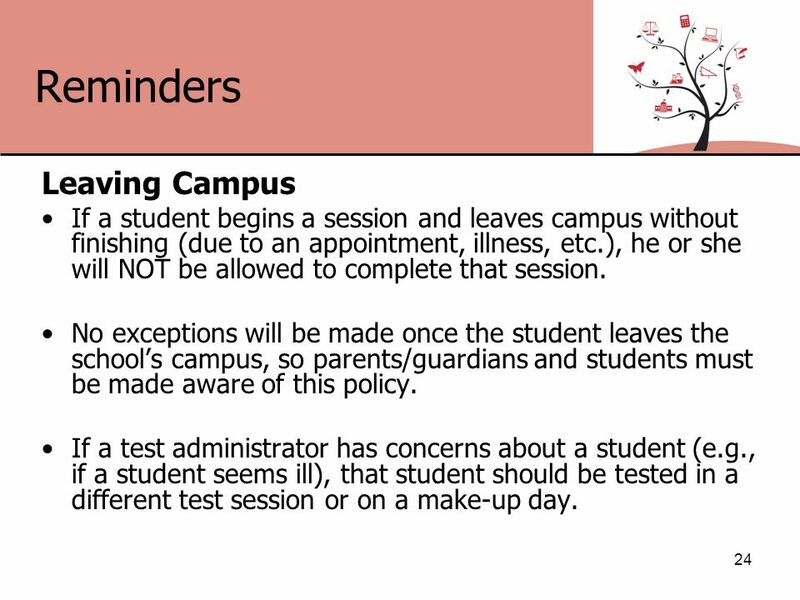 Anyone who enters a room for the purpose of monitoring a test MUST sign the log for that testing room. 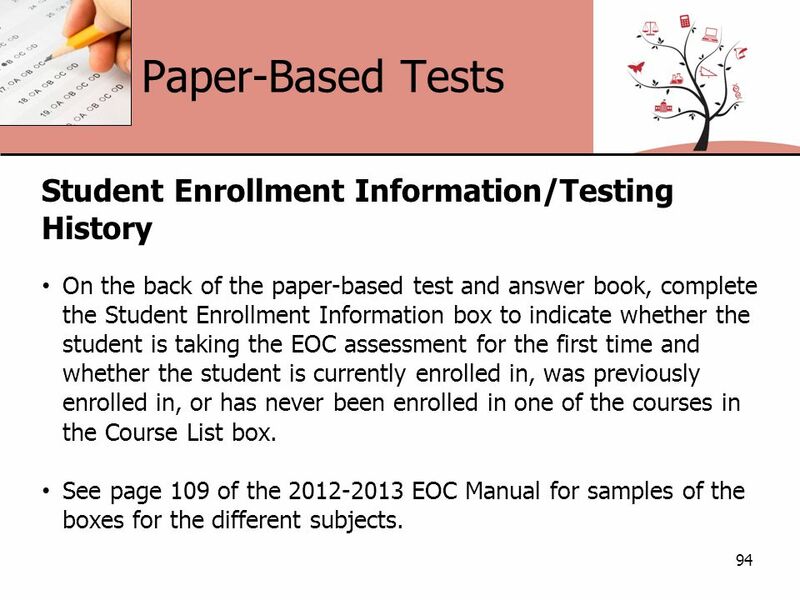 94 Paper-Based Tests 94 Student Enrollment Information/Testing History On the back of the paper-based test and answer book, complete the Student Enrollment Information box to indicate whether the student is taking the EOC assessment for the first time and whether the student is currently enrolled in, was previously enrolled in, or has never been enrolled in one of the courses in the Course List box. 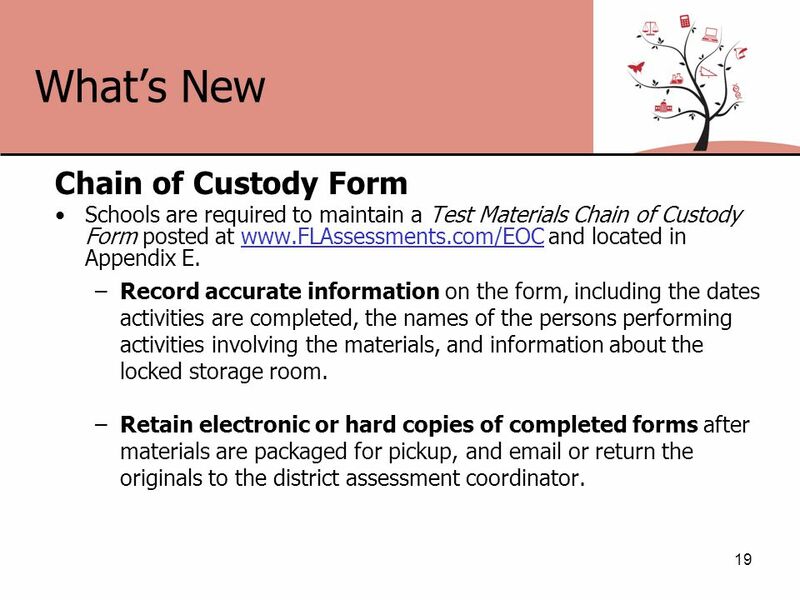 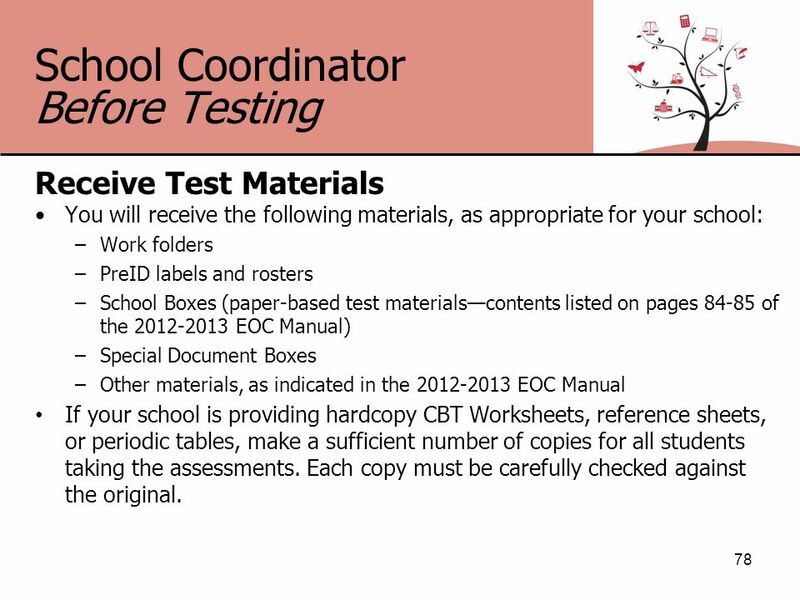 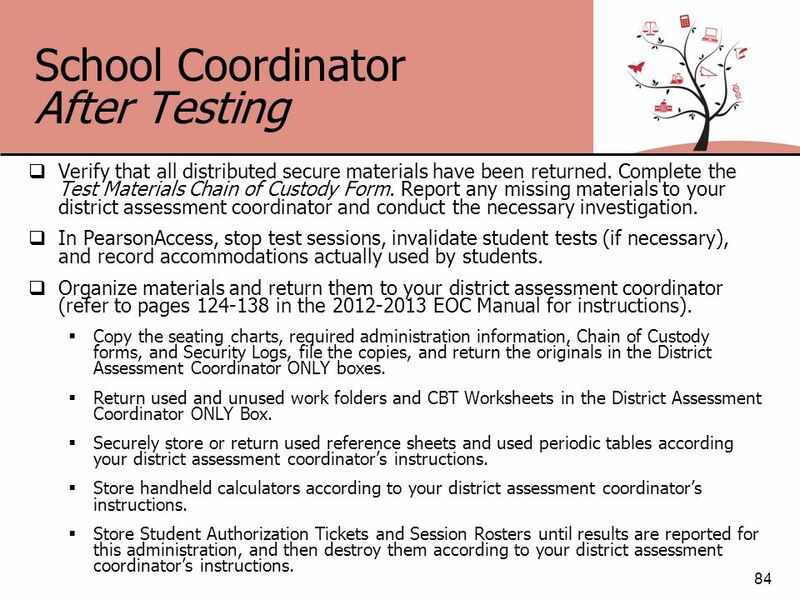 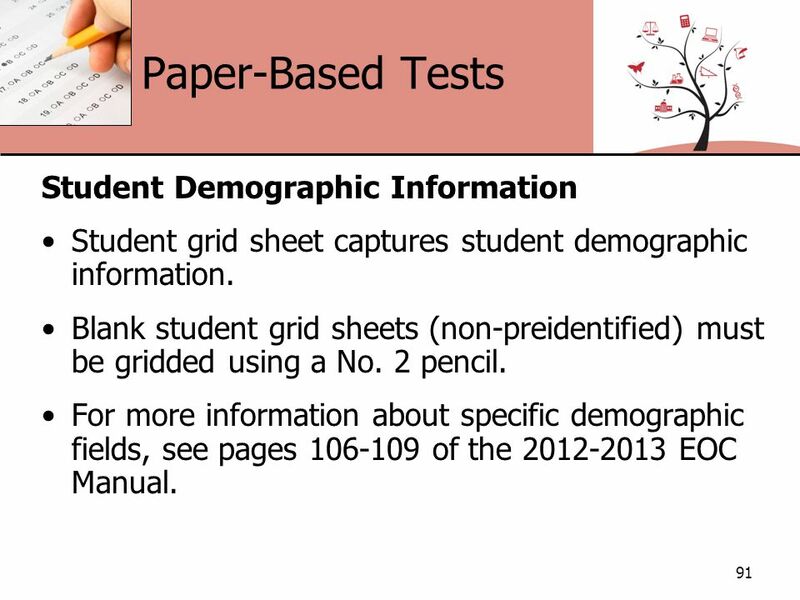 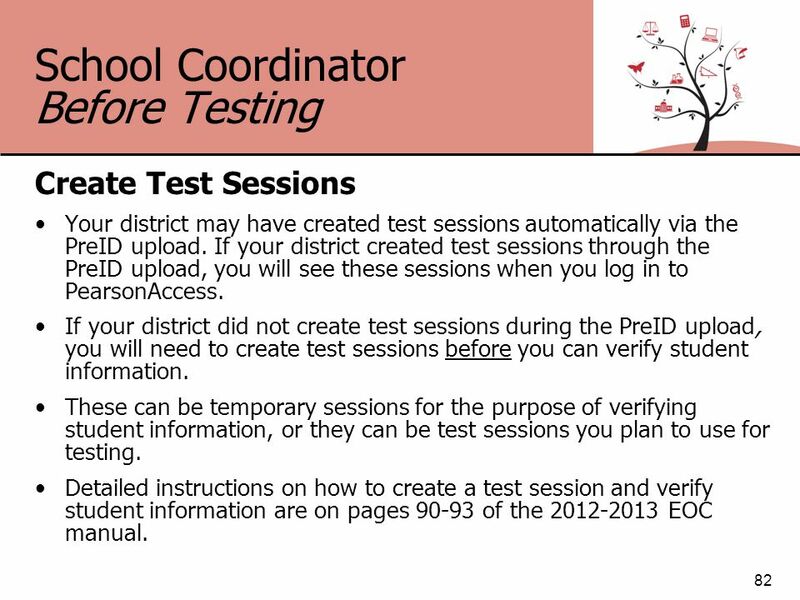 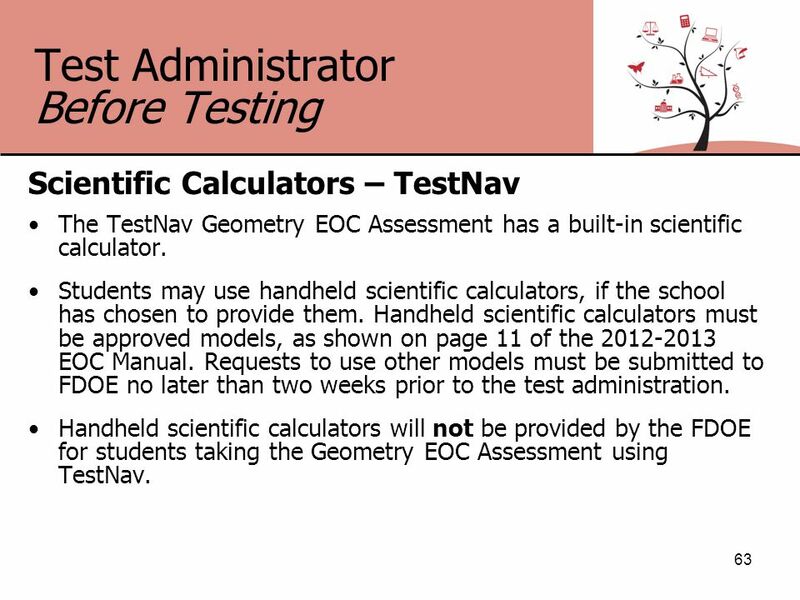 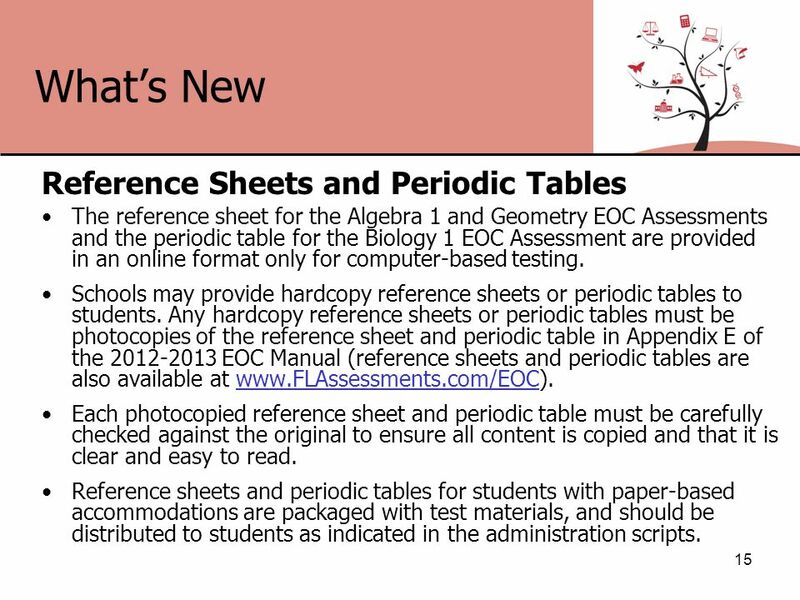 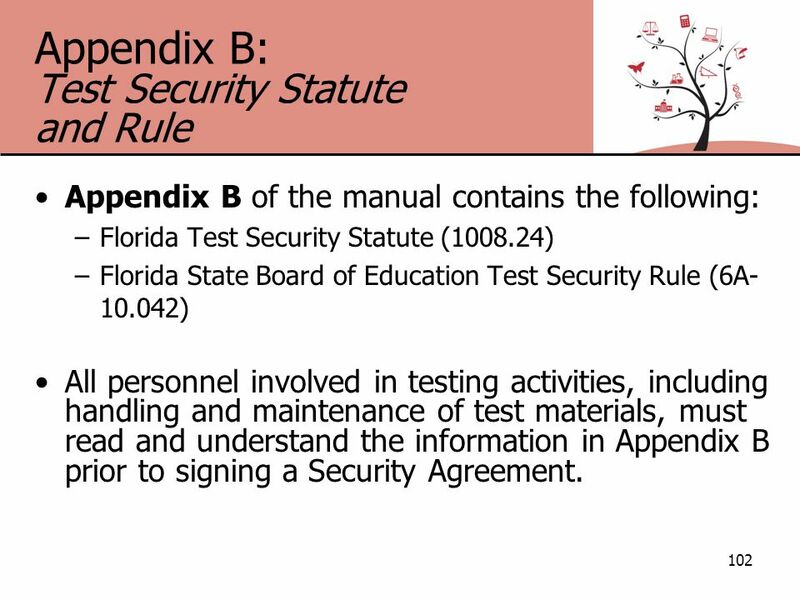 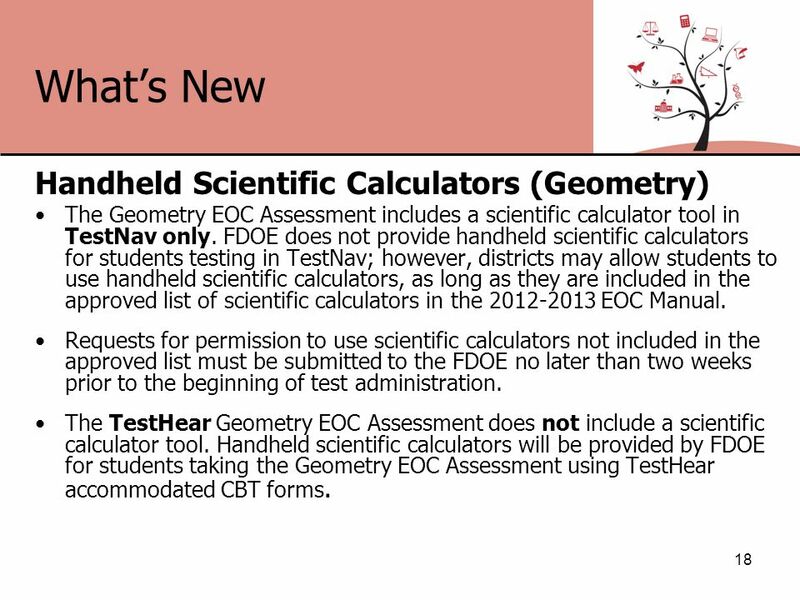 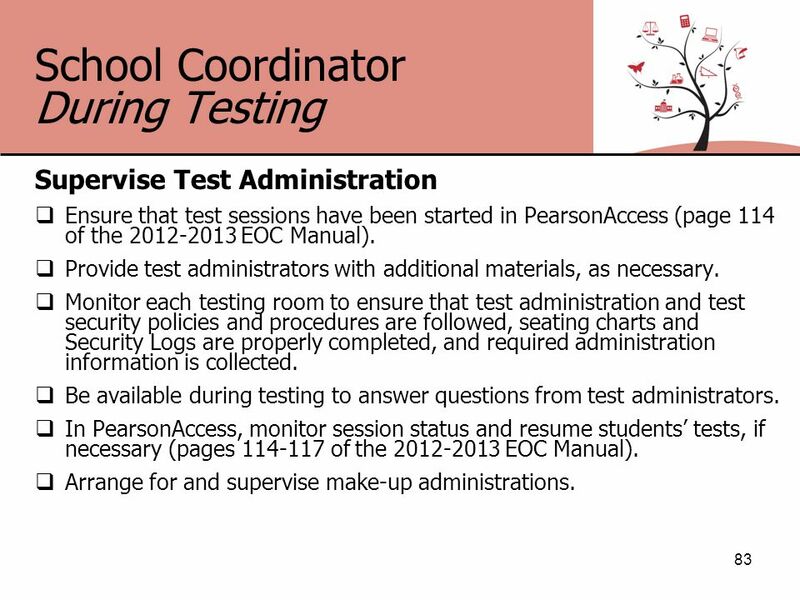 See page 109 of the 2012-2013 EOC Manual for samples of the boxes for the different subjects. 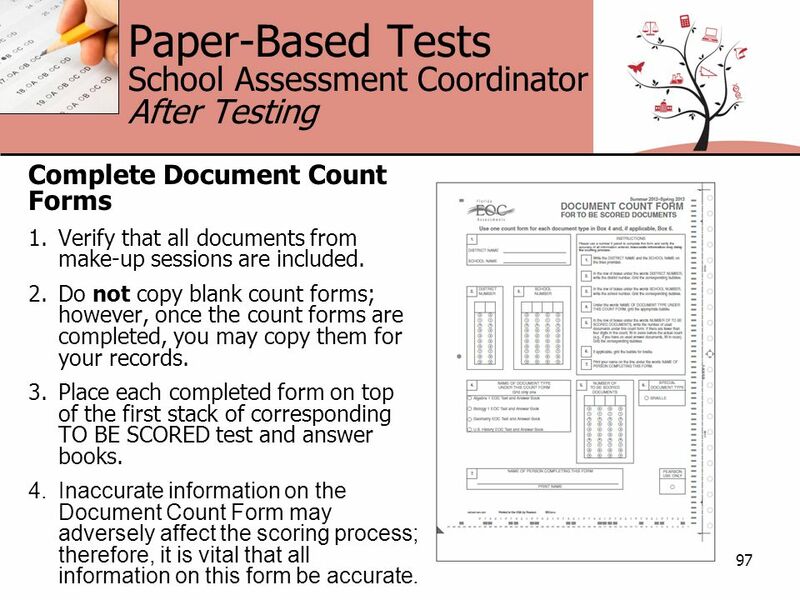 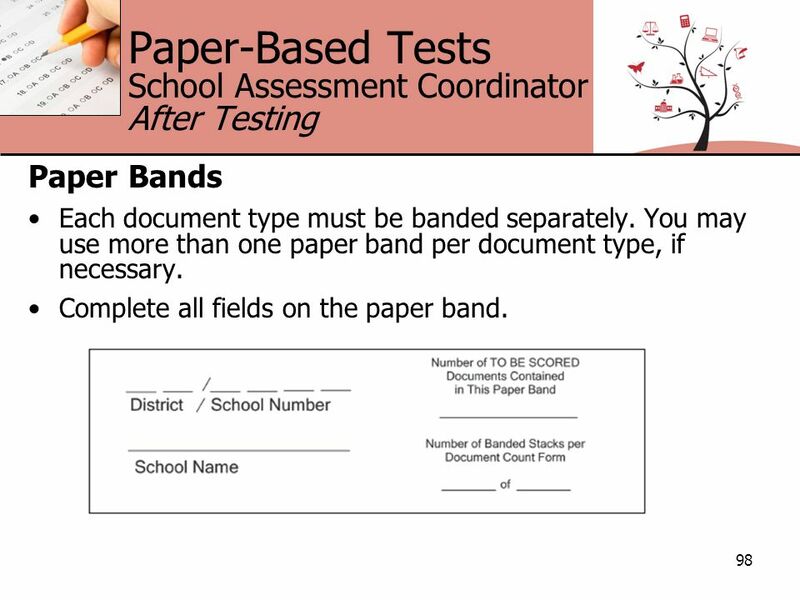 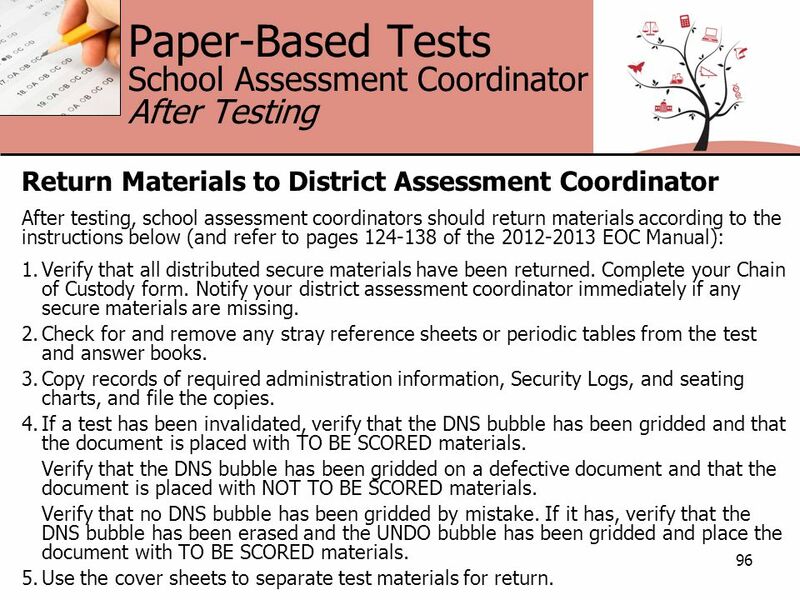 99 Paper-Based Tests School Assessment Coordinator After Testing 99 Package Materials for Return Prepare the following types of boxes for return to your district assessment coordinator (as appropriate): Algebra 1 TO BE SCORED documents—Transcribed Biology 1 TO BE SCORED documents—Transcribed Geometry TO BE SCORED documents—Transcribed U.S. History TO BE SCORED documents—Transcribed All NOT TO BE SCORED materials—Yellow-labeled boxes. 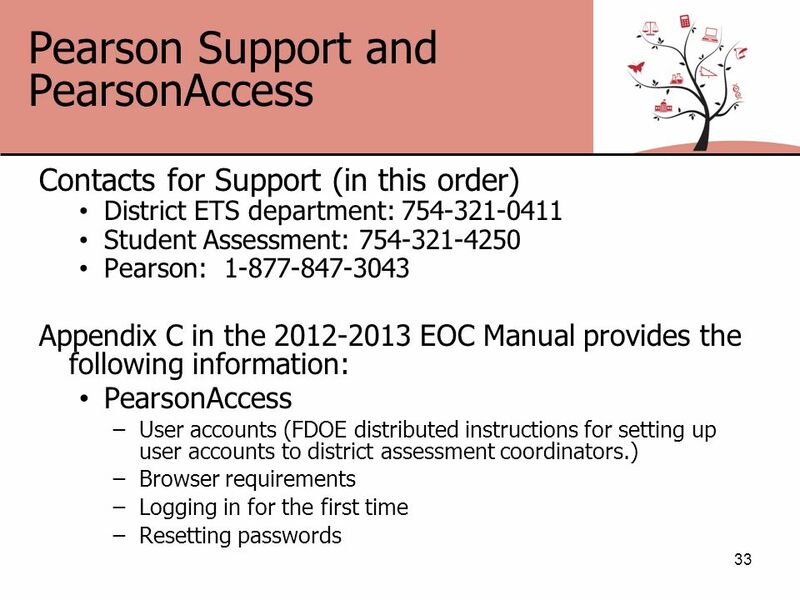 All transcribed books go here. 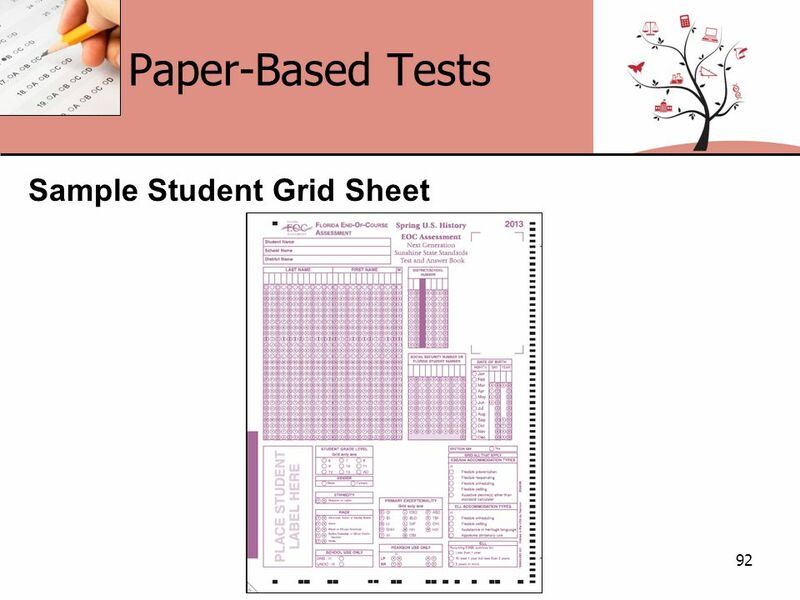 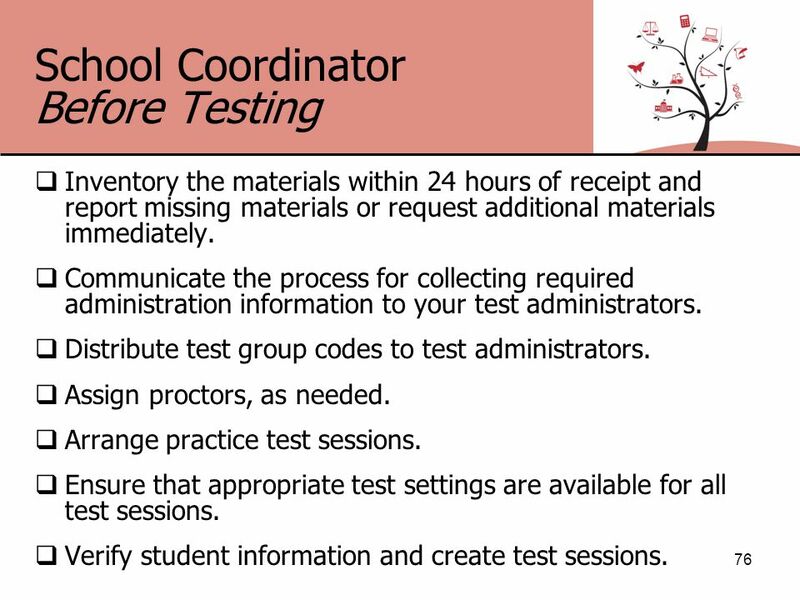 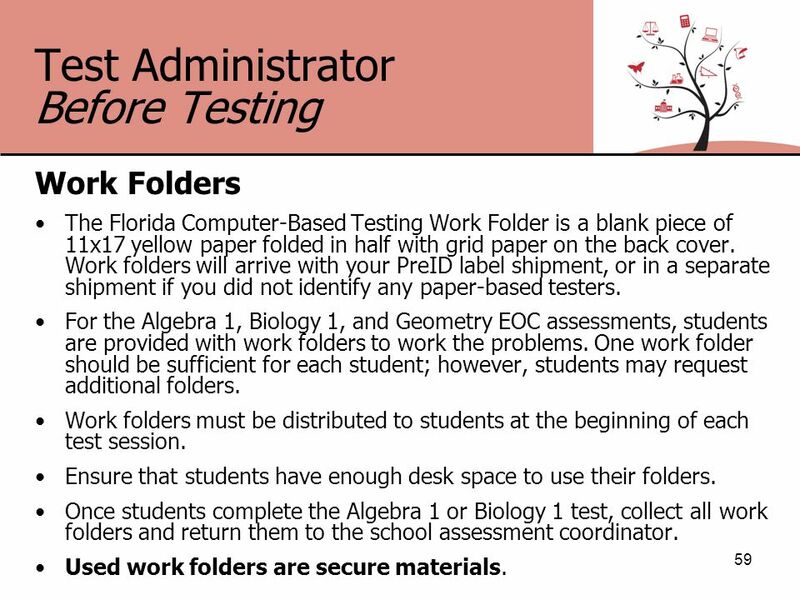 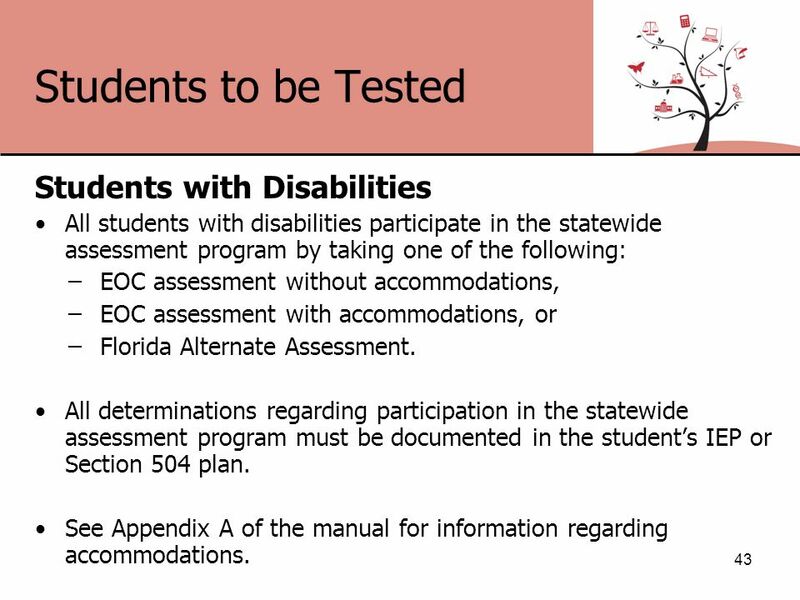 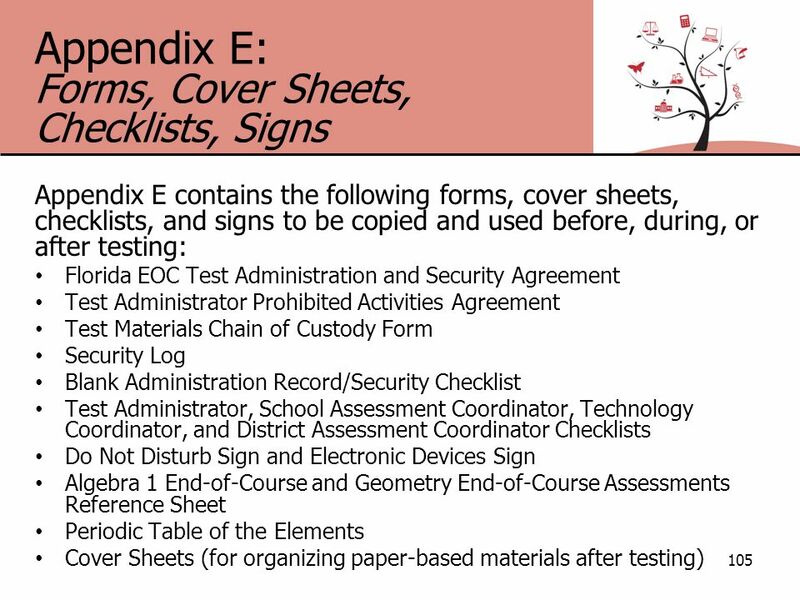 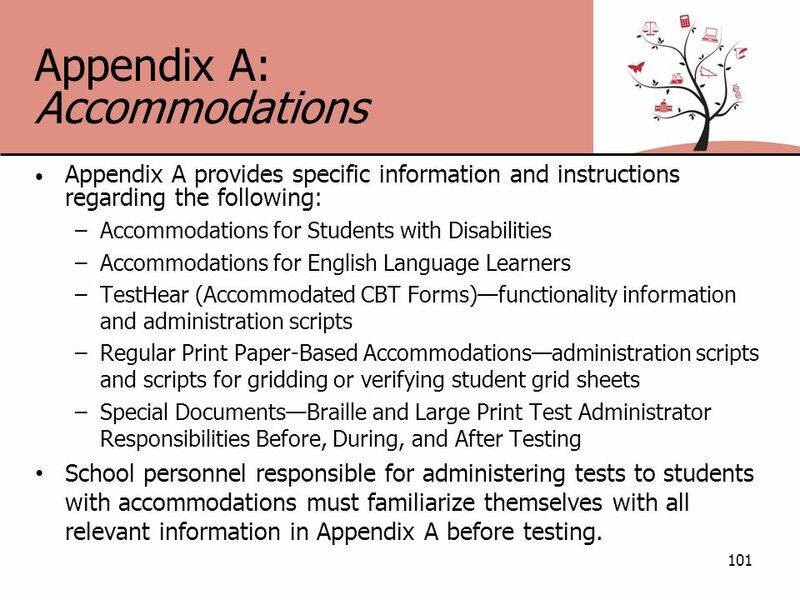 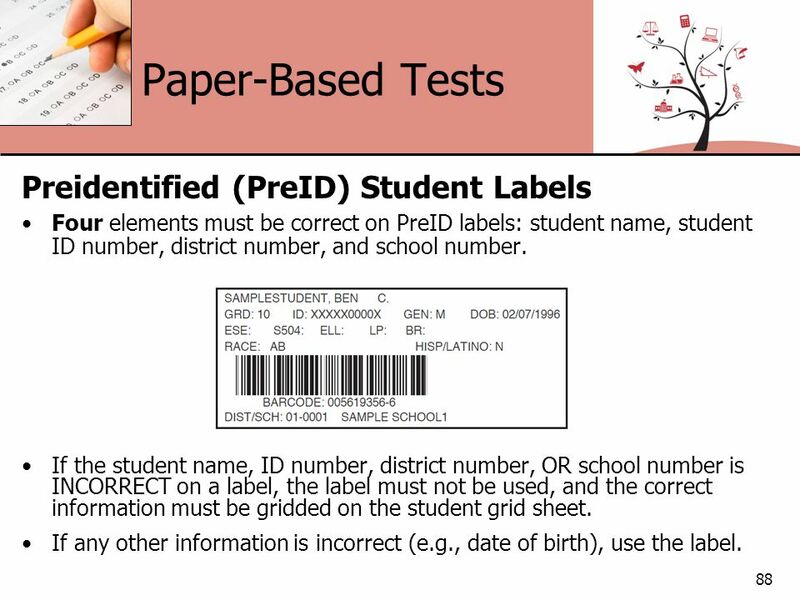 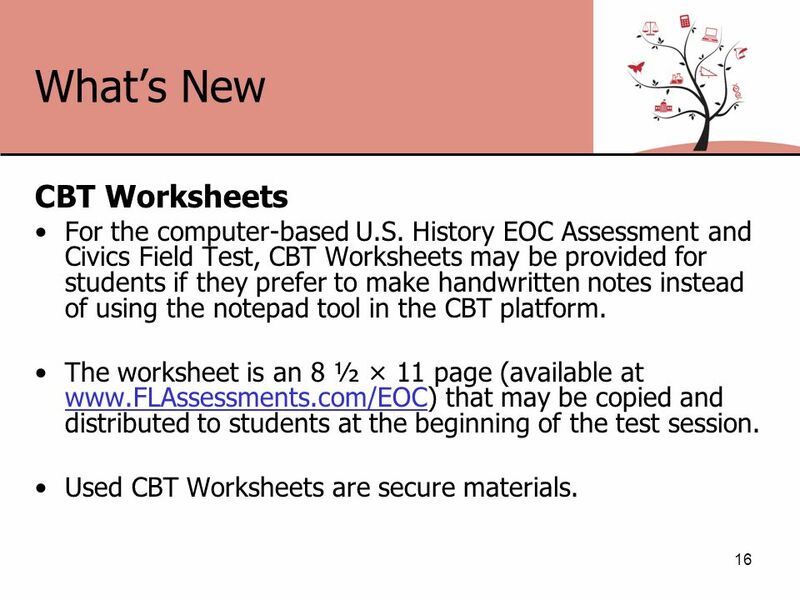 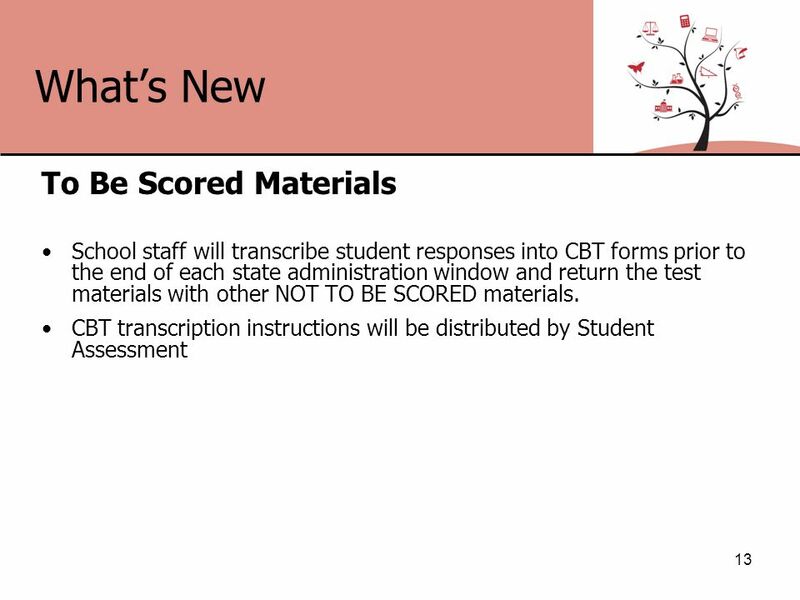 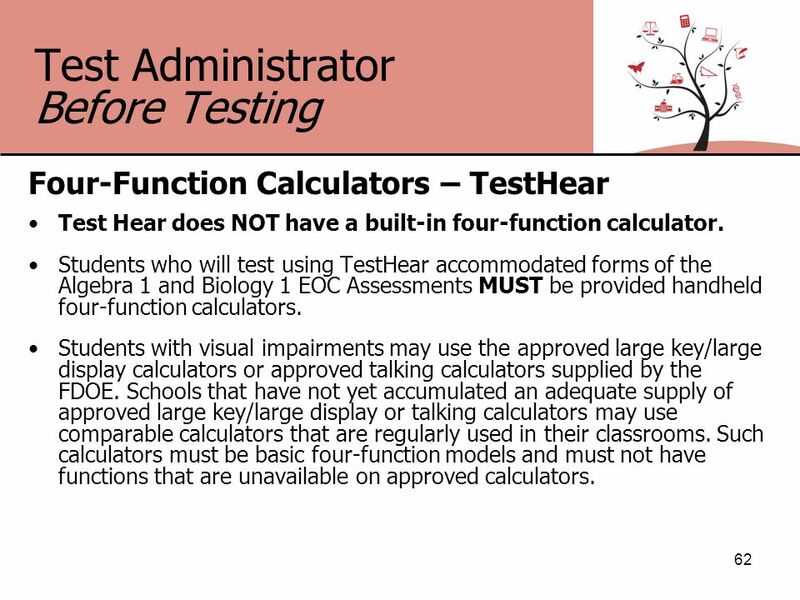 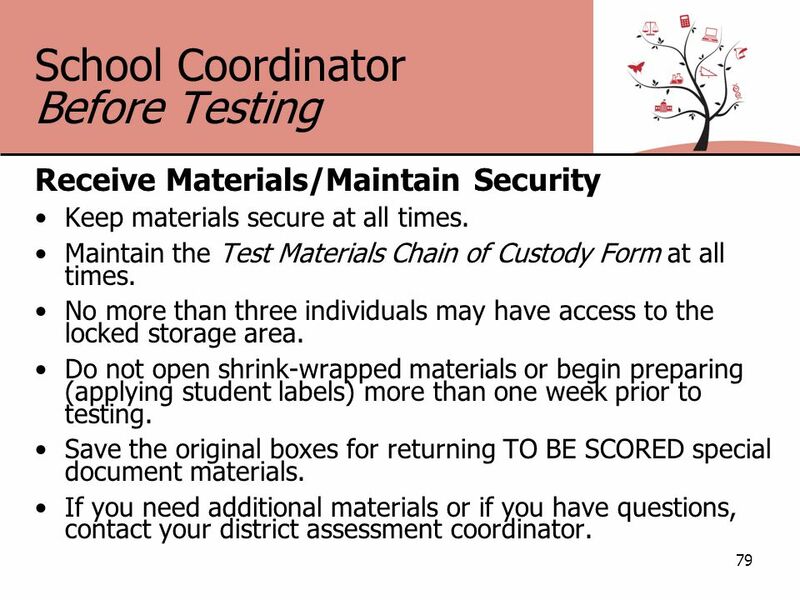 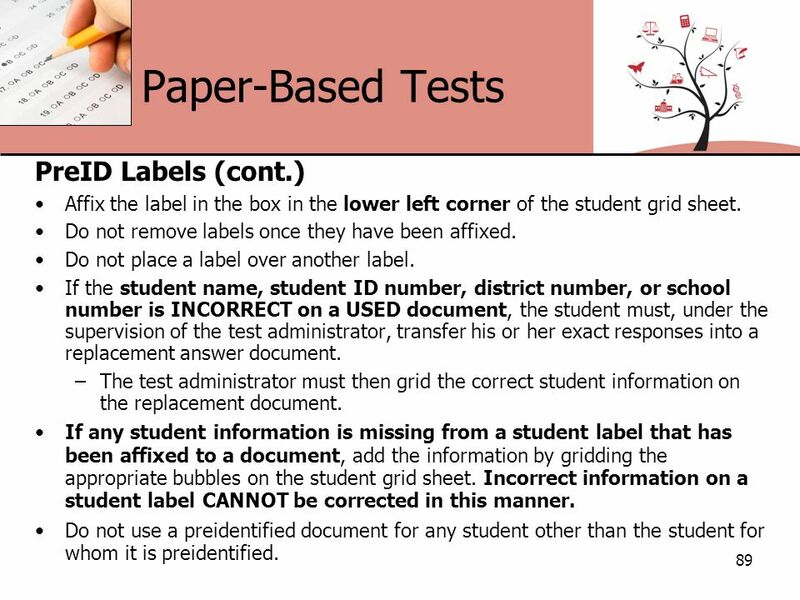 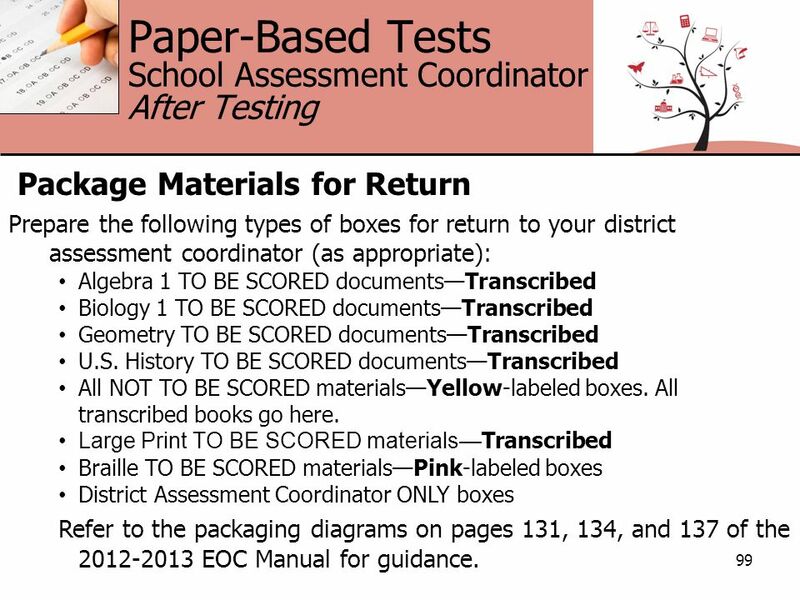 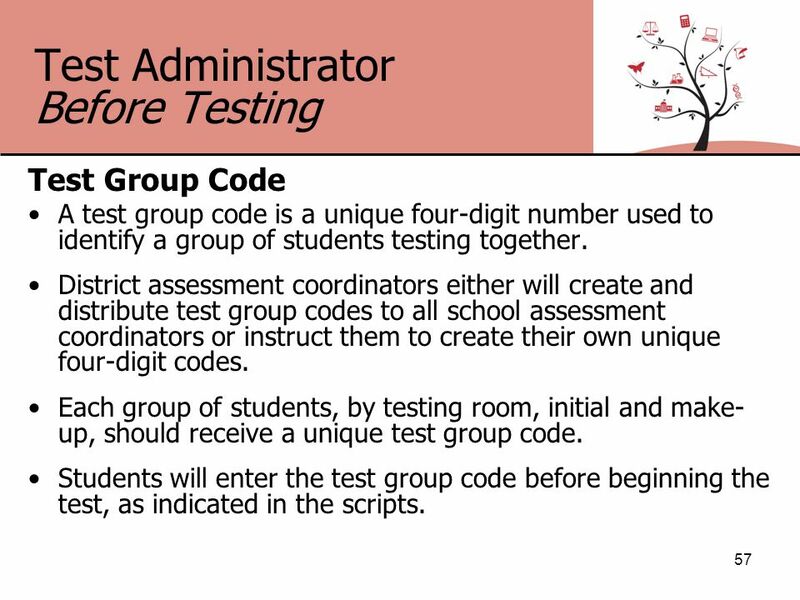 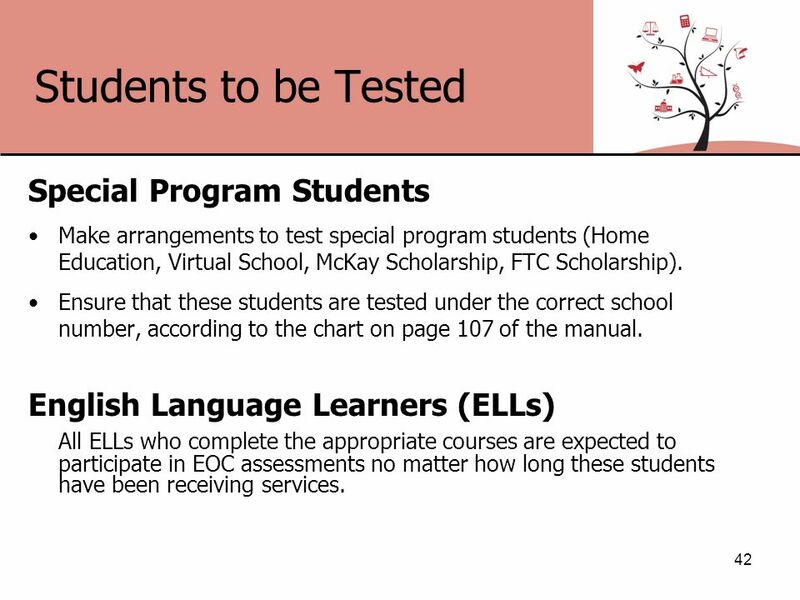 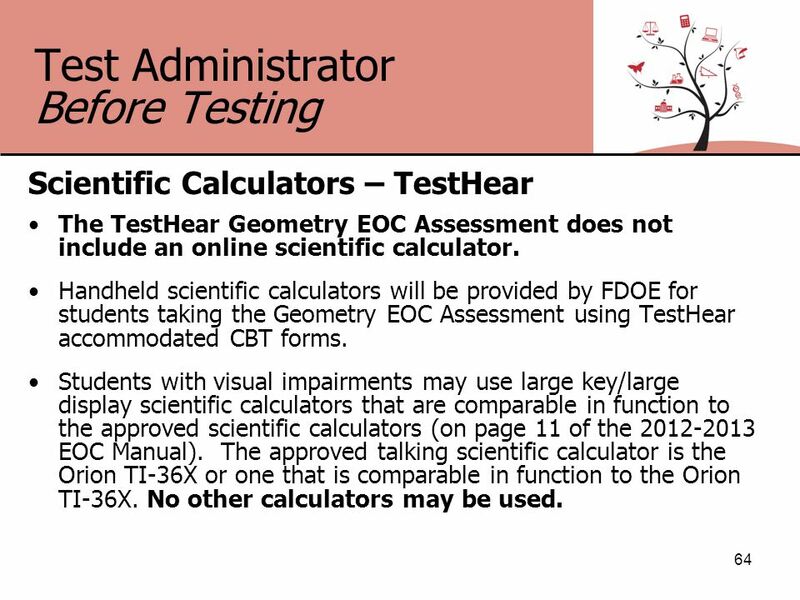 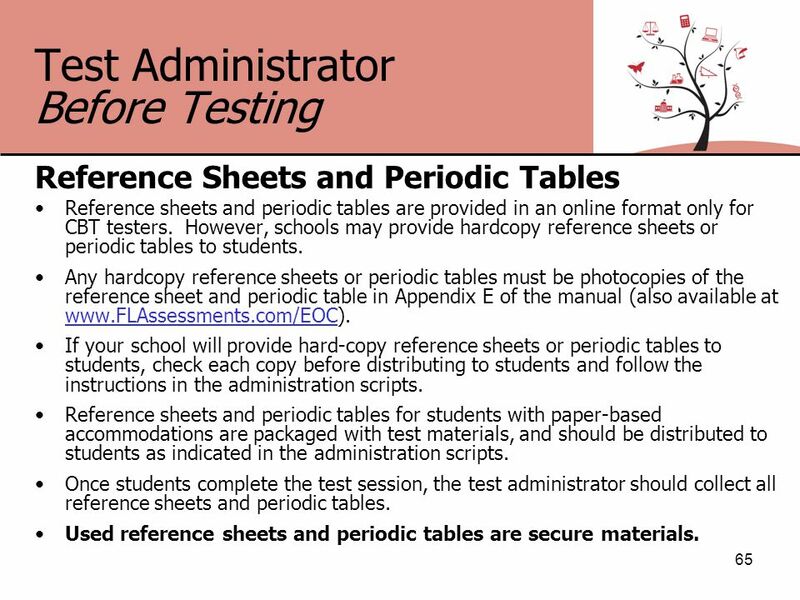 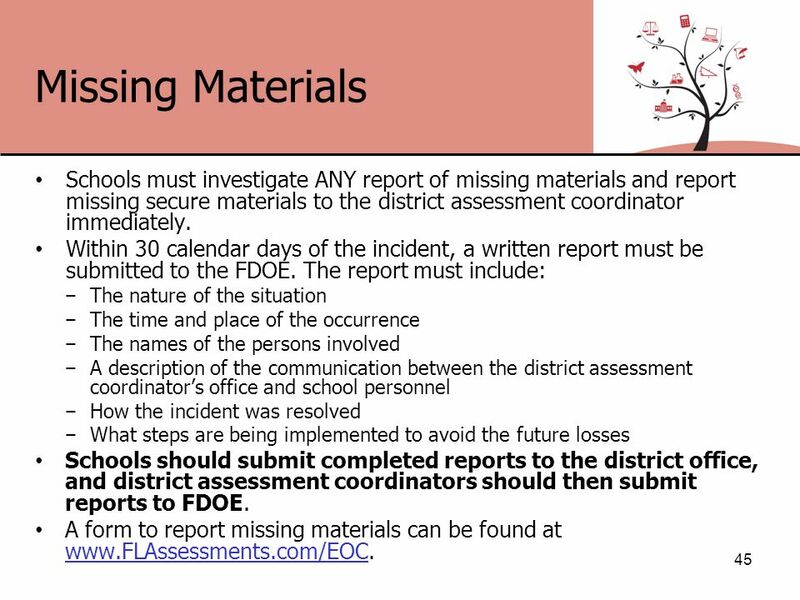 Large Print TO BE SCORED materials— Transcribed Braille TO BE SCORED materials—Pink-labeled boxes District Assessment Coordinator ONLY boxes Refer to the packaging diagrams on pages 131, 134, and 137 of the 2012-2013 EOC Manual for guidance. 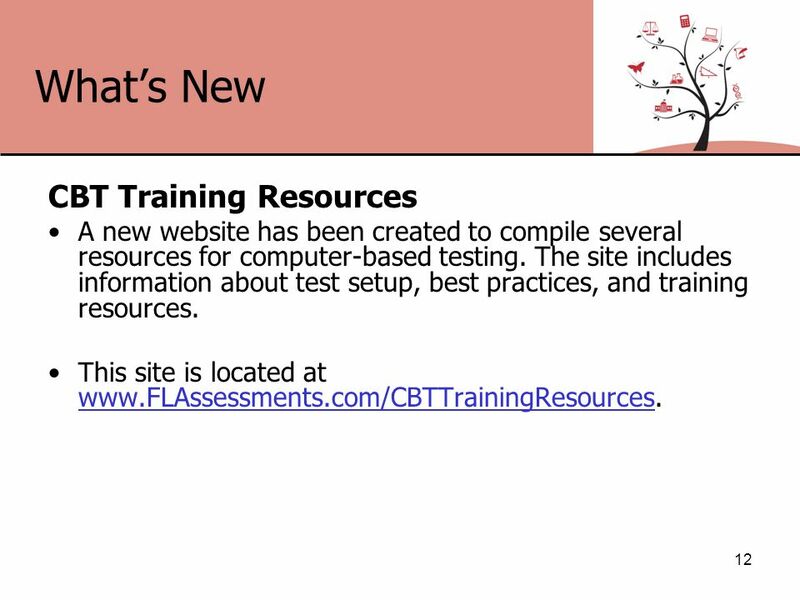 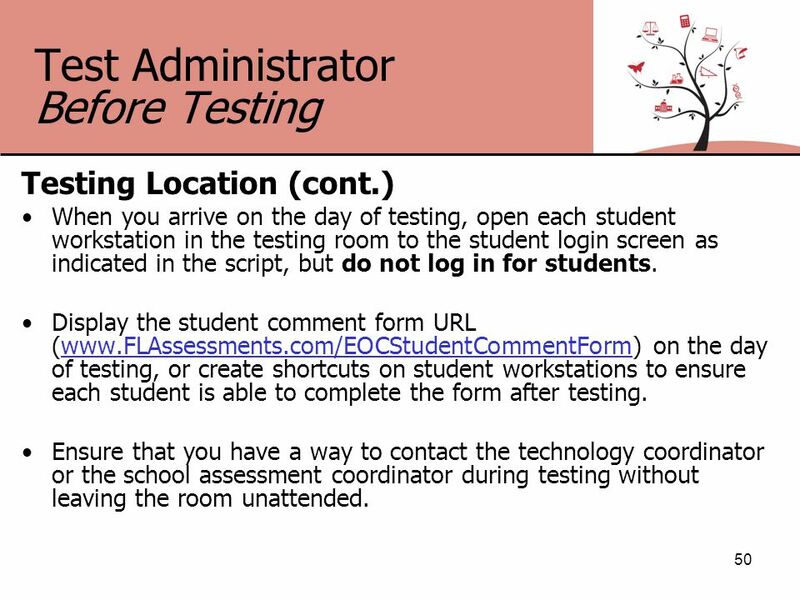 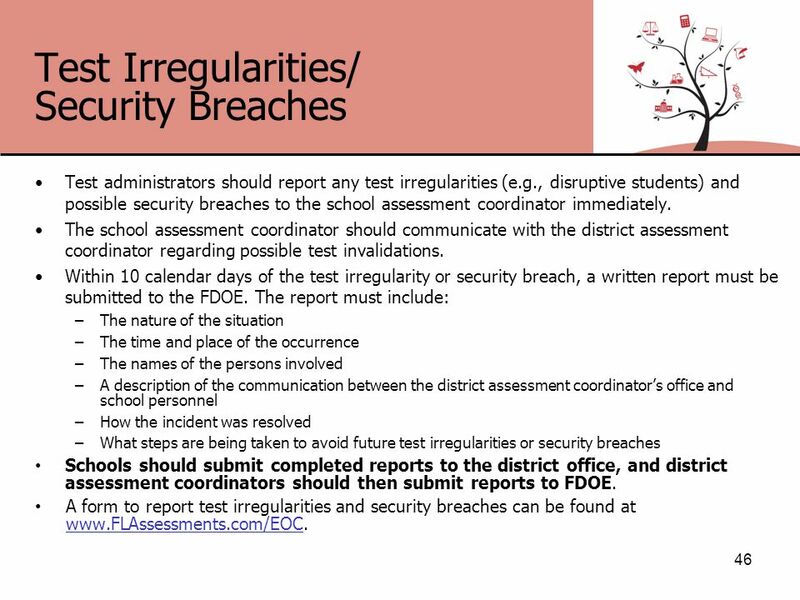 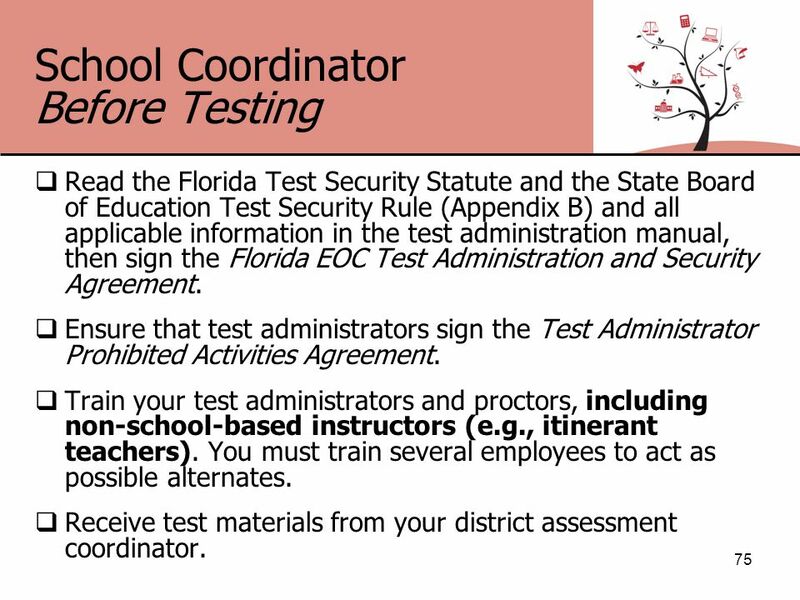 106 Comment Forms 106 After testing, test administrators, school coordinators, technology coordinators, and district coordinators are encouraged to complete a CBT comment form located at www.FLAssessments.com/EOC. 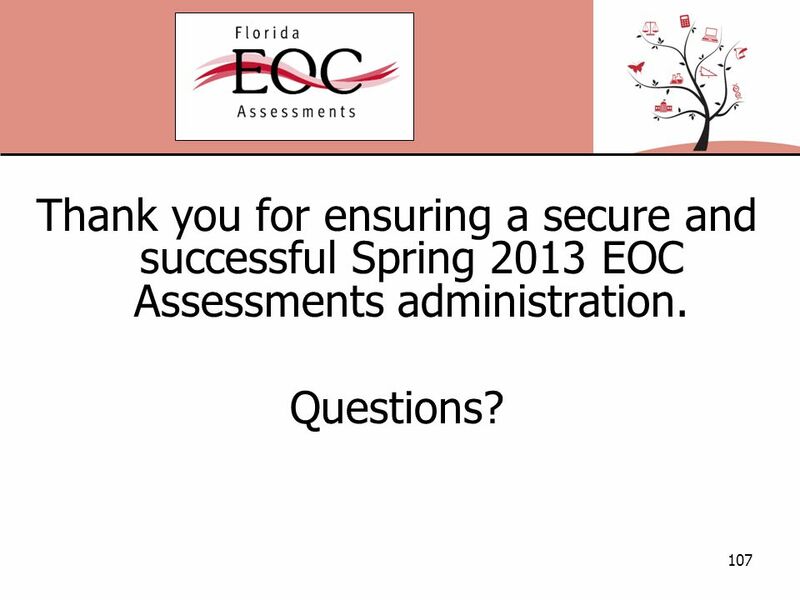 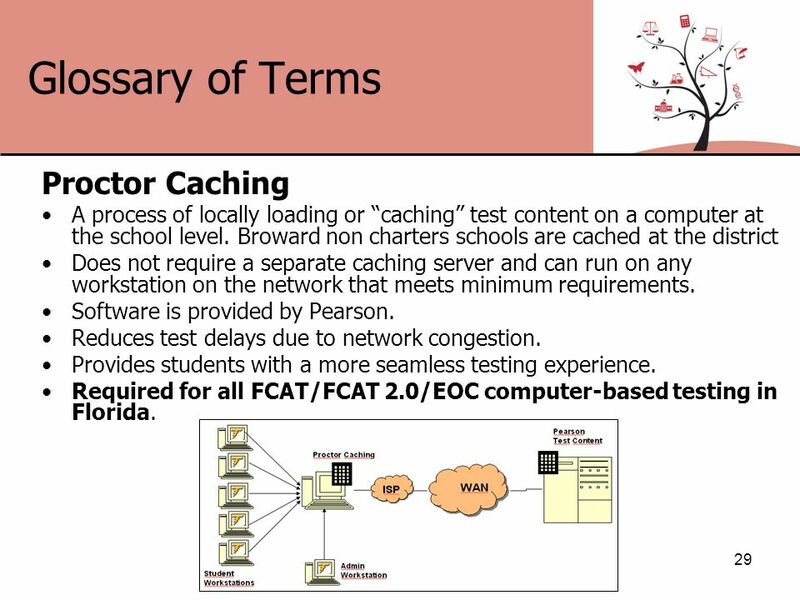 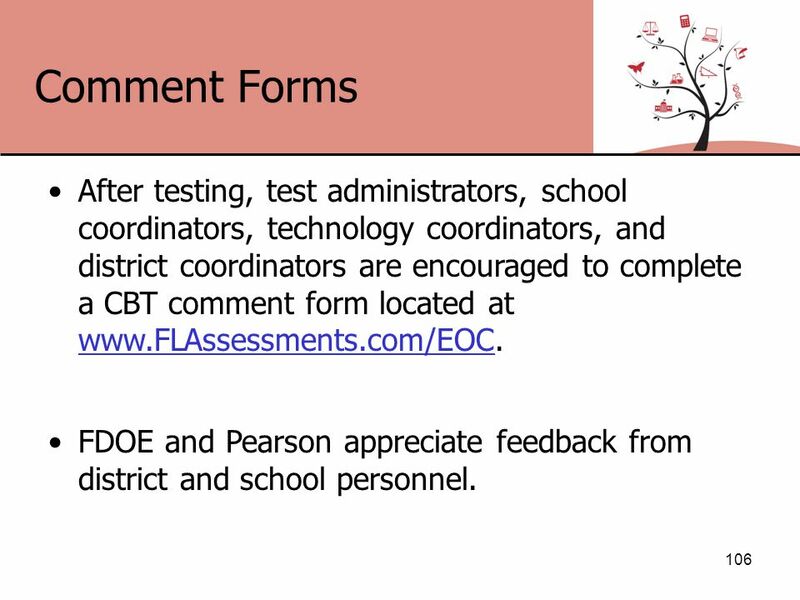 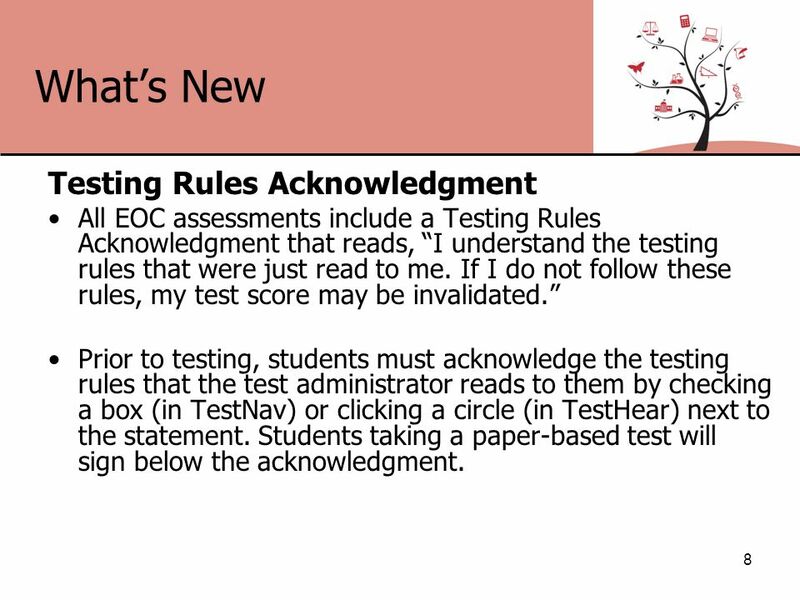 www.FLAssessments.com/EOC FDOE and Pearson appreciate feedback from district and school personnel. 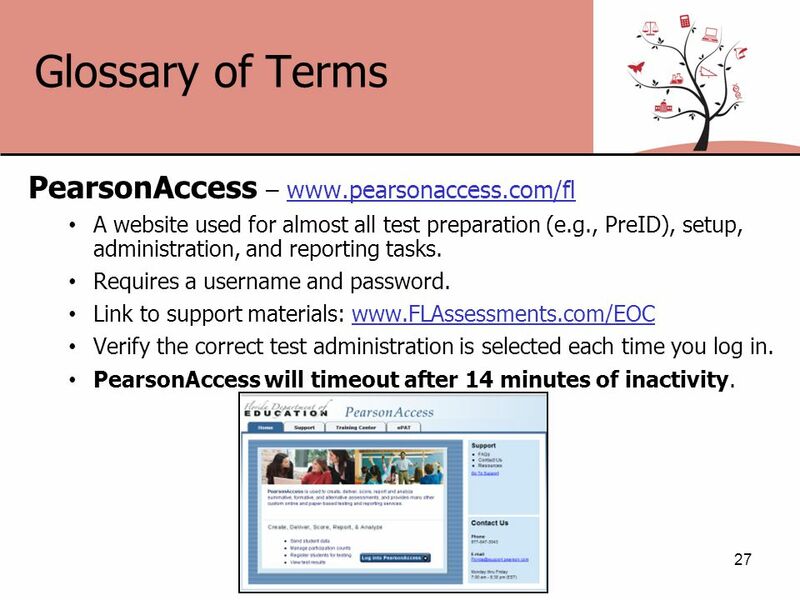 Download ppt "Spring 2013 End-of-Course Assessments Training Materials Algebra 1 Biology 1 Geometry U.S. History Civics Field Test 1." 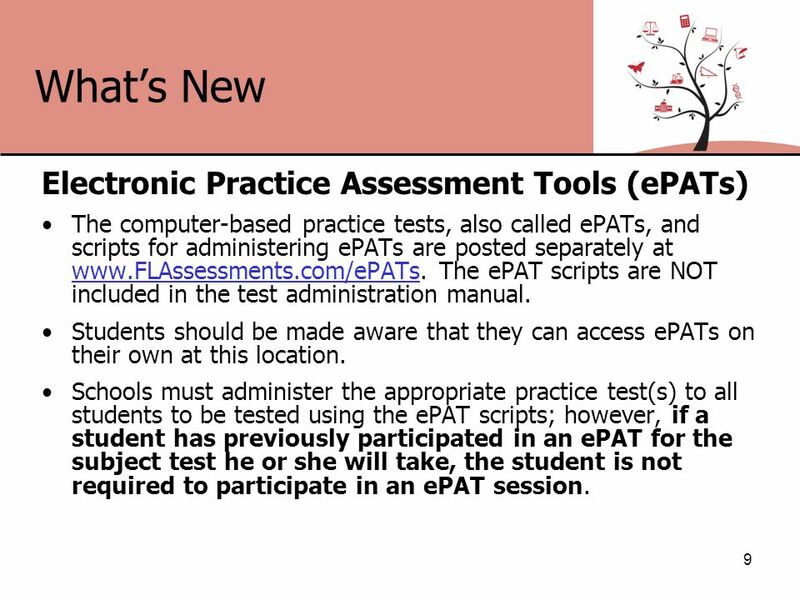 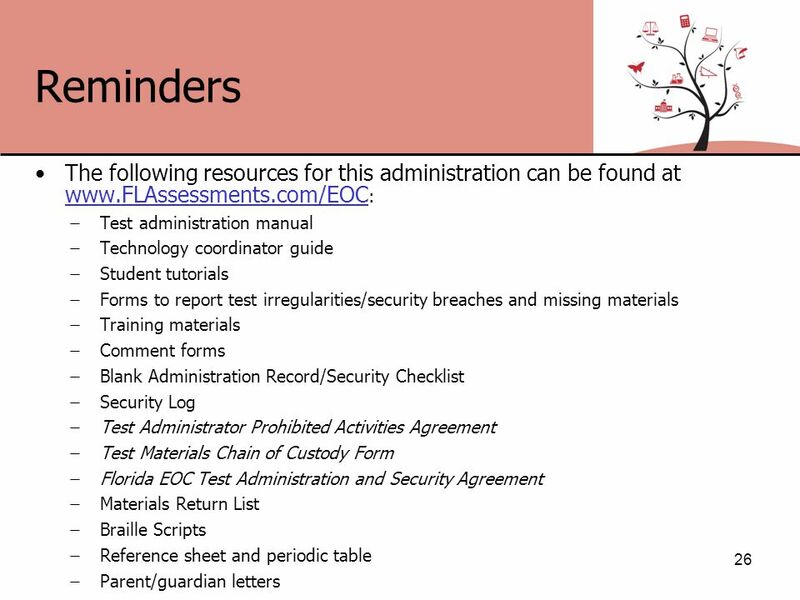 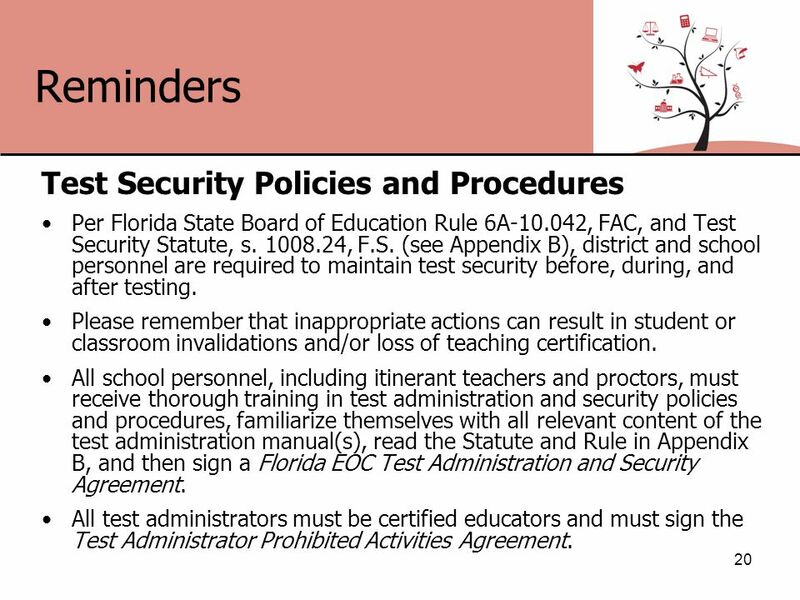 Spring 2013 FCAT 2.0 Writing Training Materials Test Administrators and Proctors. 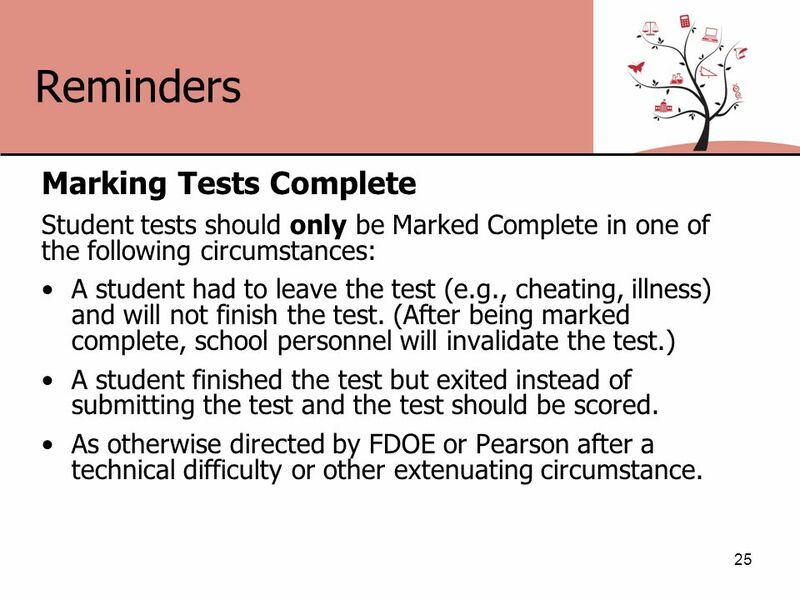 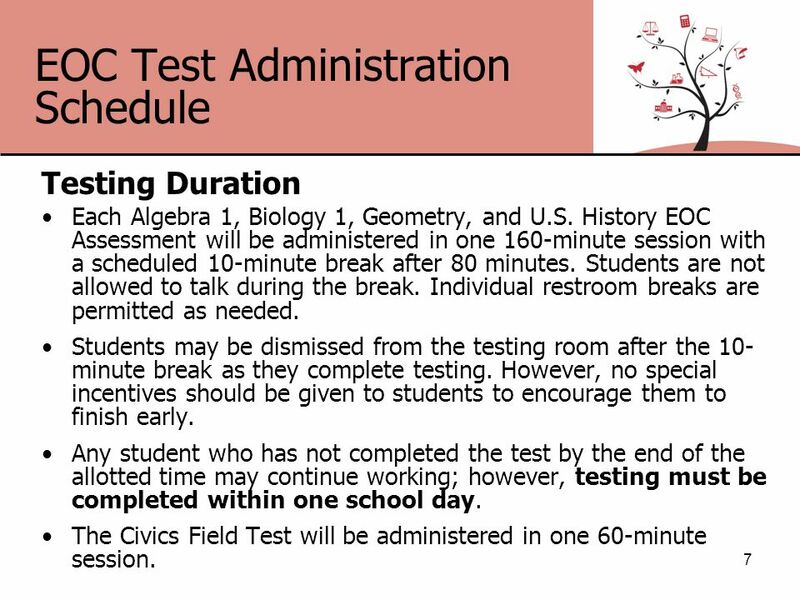 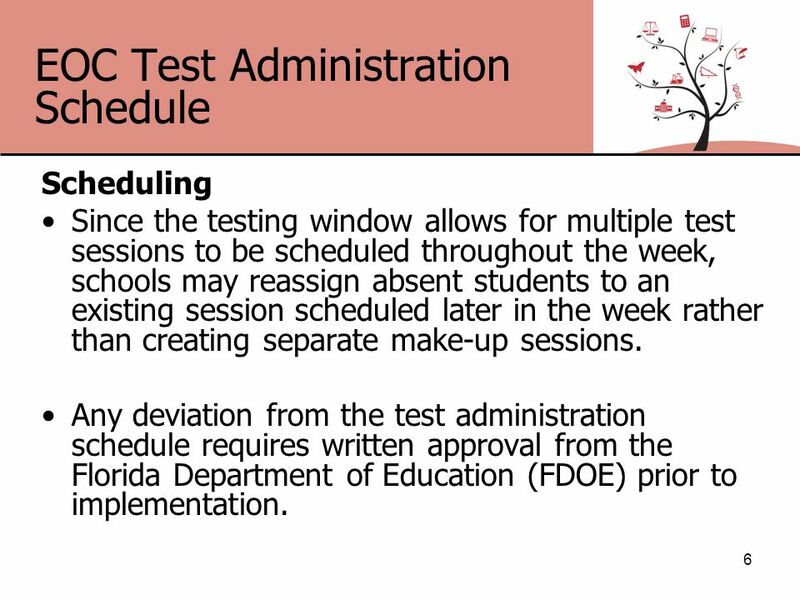 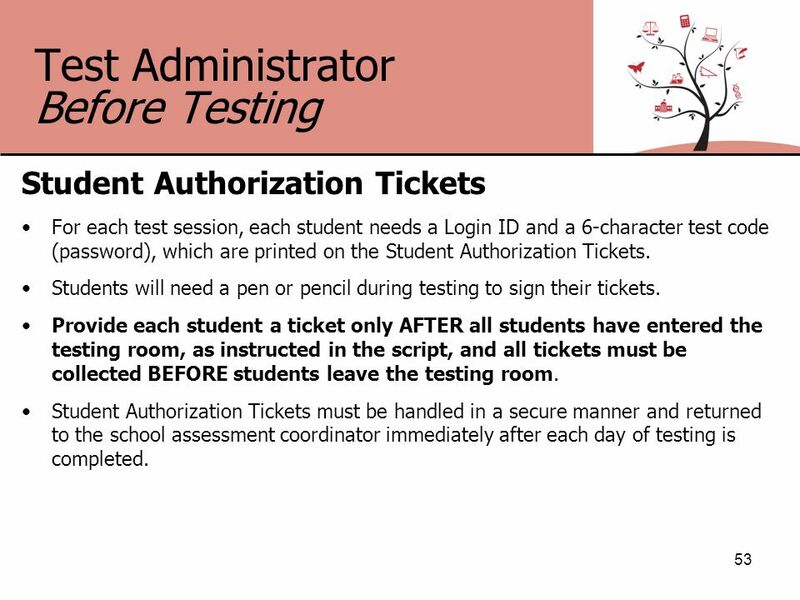 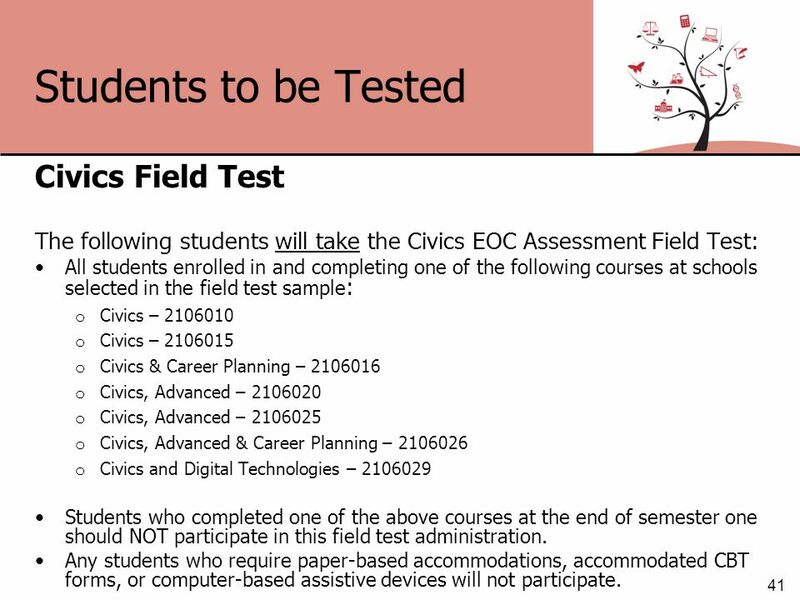 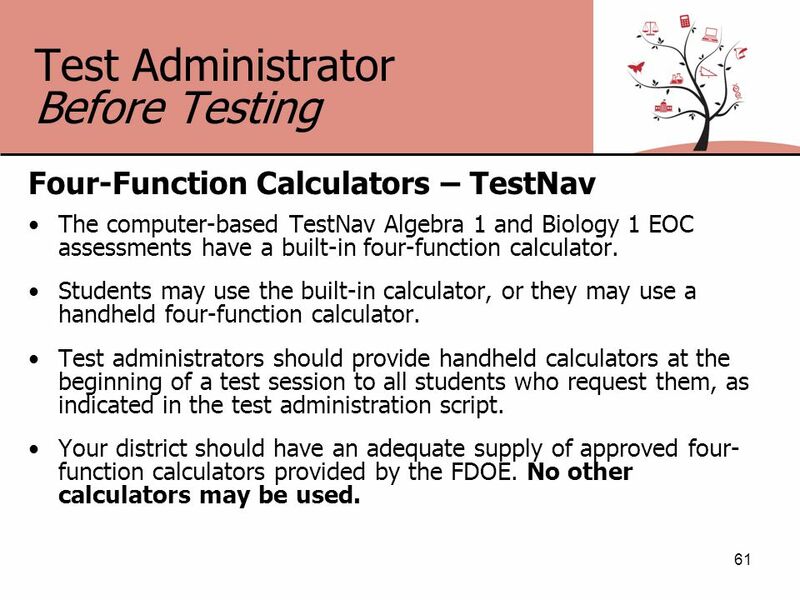 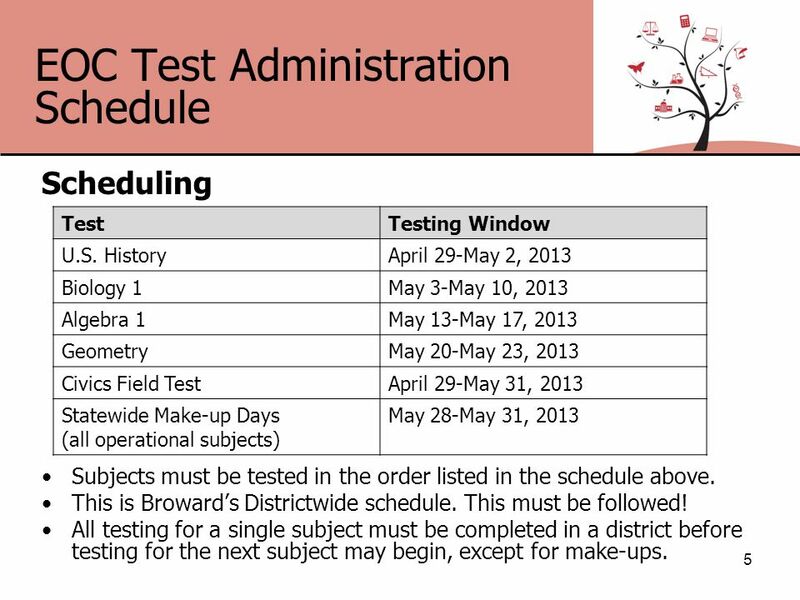 FCAT Writing Field Test December 4 th & 5 th 2012. 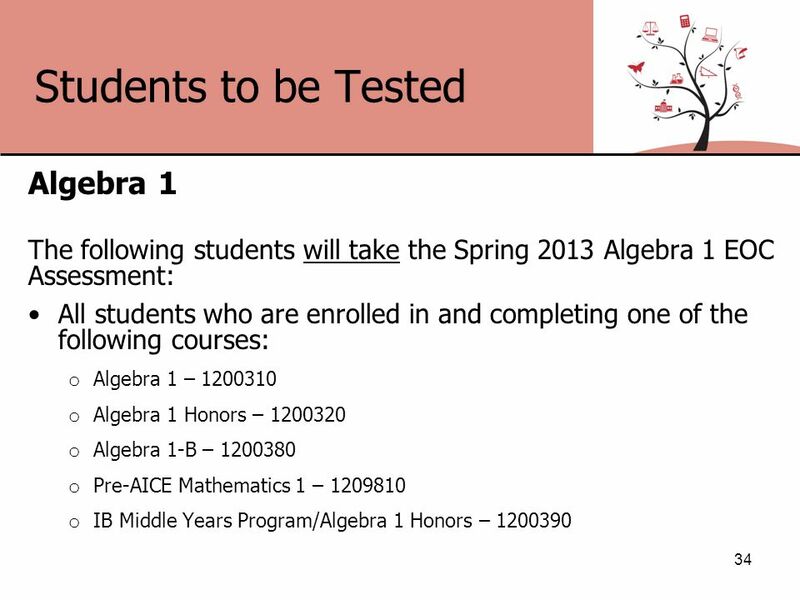 Winter Algebra 1 End-of-Course TRAINING MATERIALS. 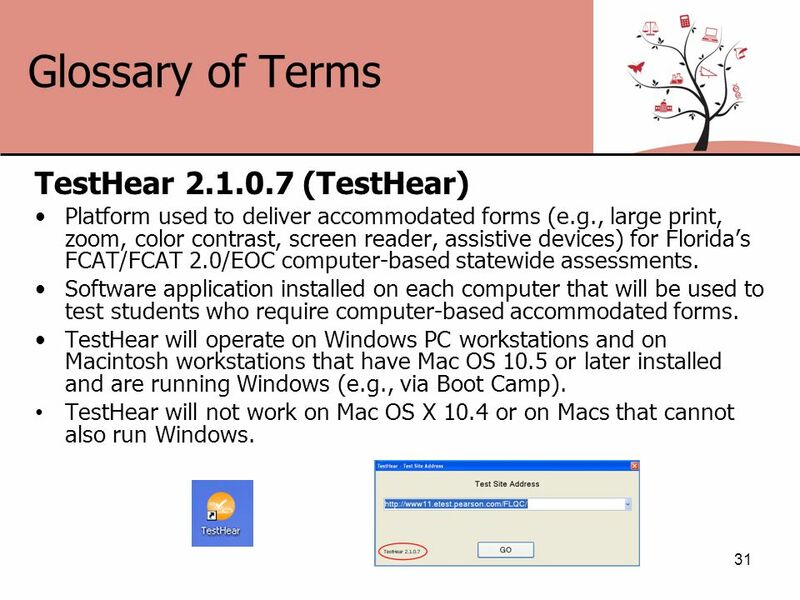 INTRODUCTION TO SPRING 2013 COMPUTER-BASED TESTING GRADE 5 FCAT 2.0 MATHEMATICS 1. 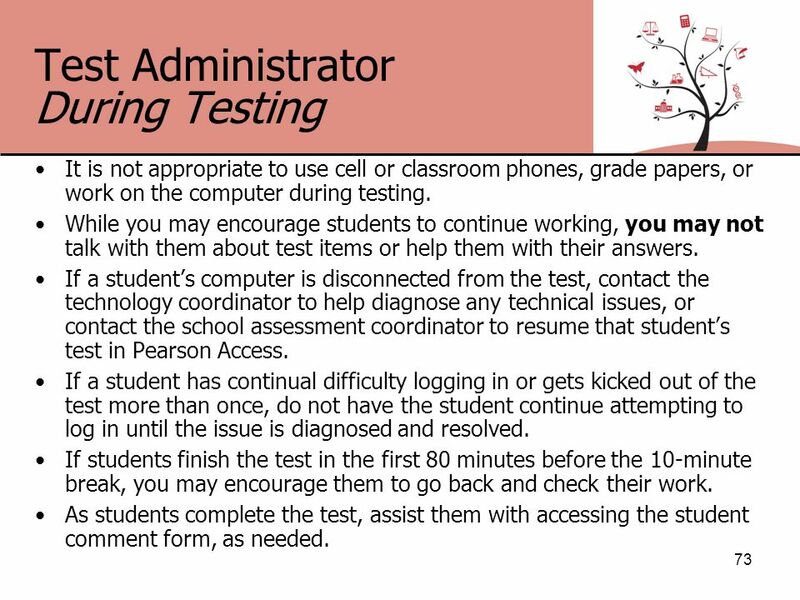 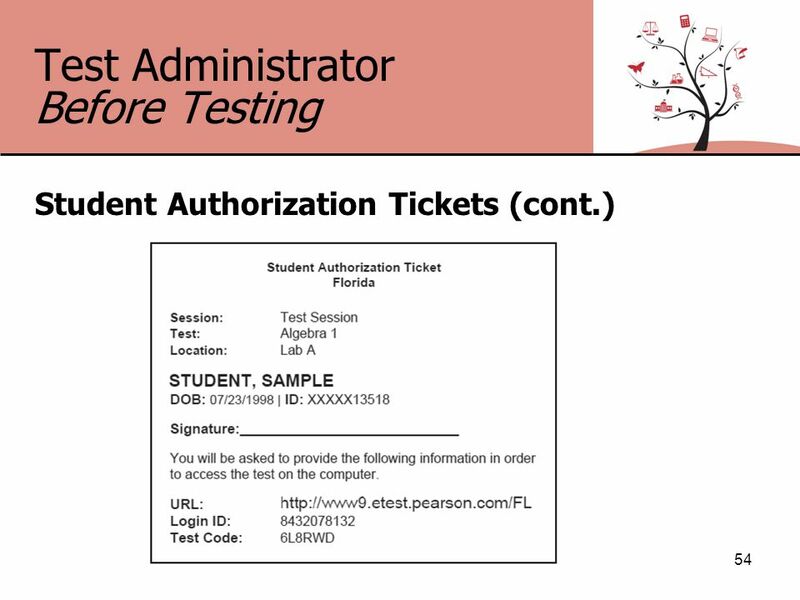 INTRODUCTION TO SPRING 2014 COMPUTER-BASED TESTING 1. 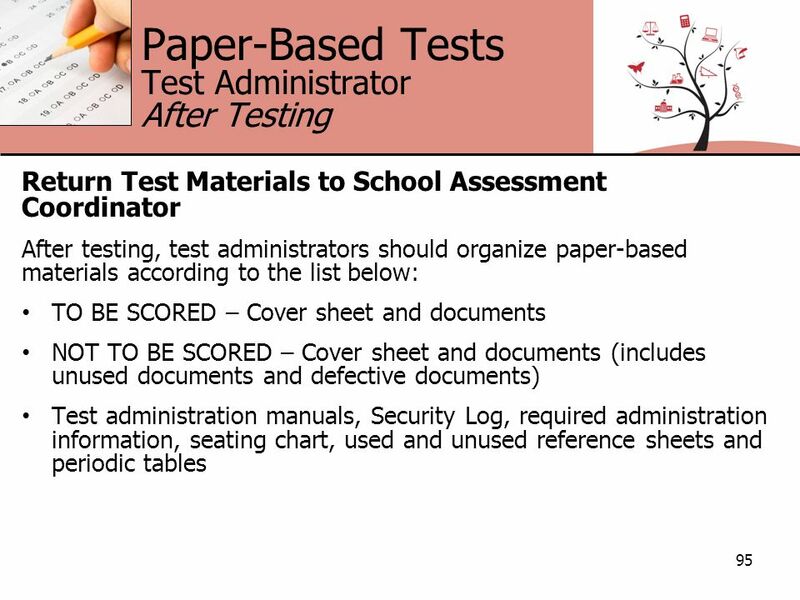 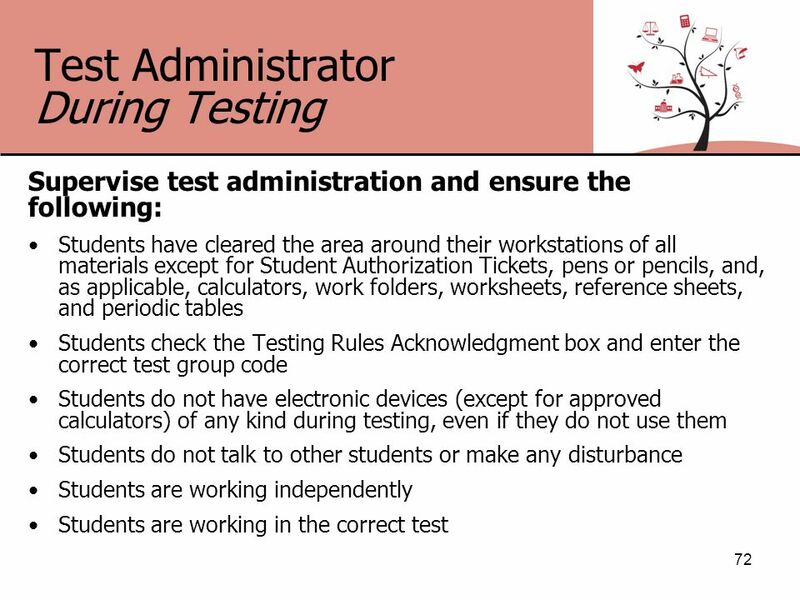 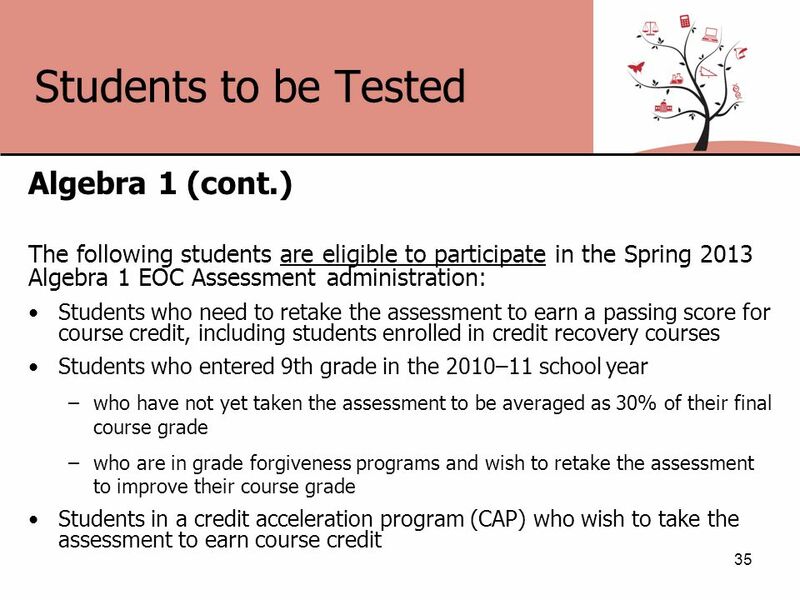 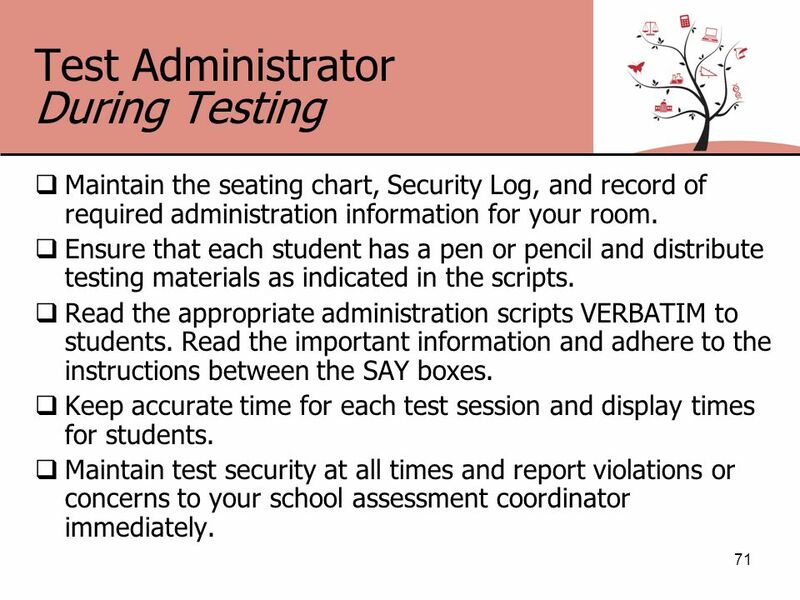 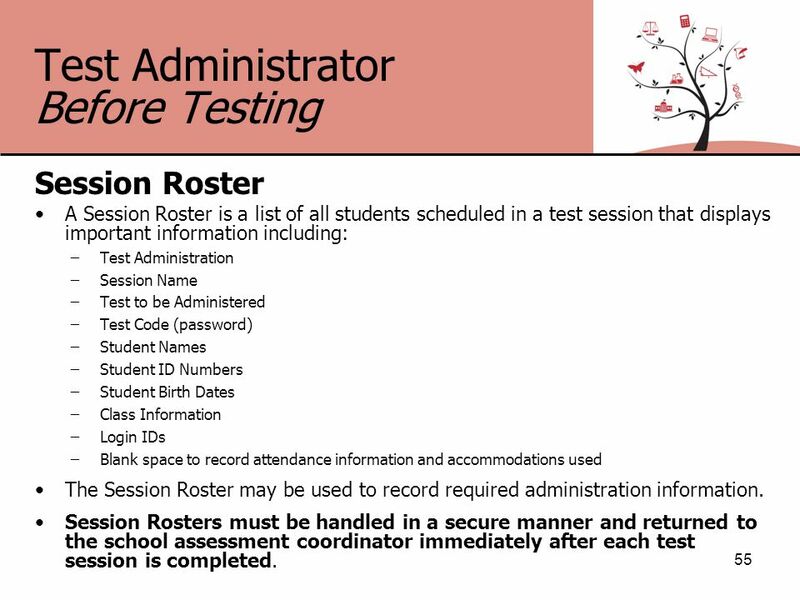 1 Test Administrator Training Grades 4, 8, & 10 Science SBA Spring 2015. 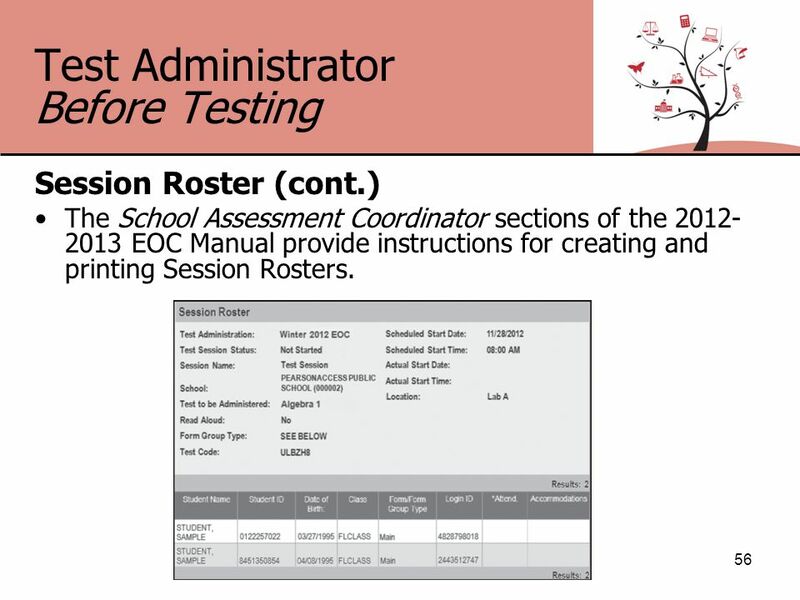 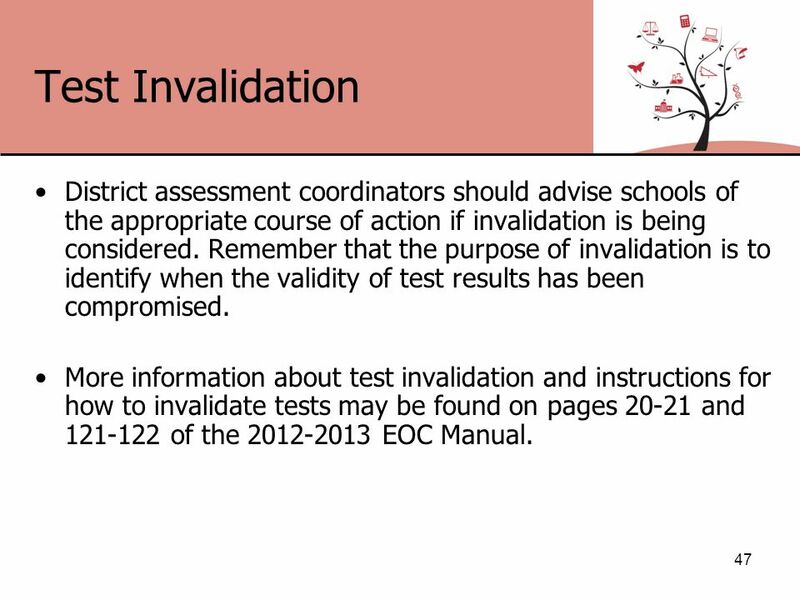 STAAR Alternate 2 Preparing for the STAAR Alternate 2 Assessment 2015. 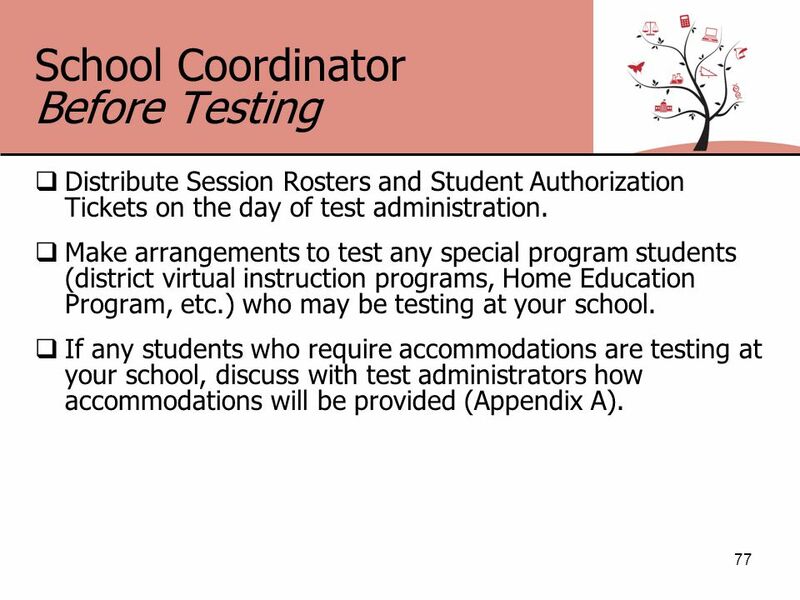 TESTING PROGRAM: SCHOOL: GRADE(S): DATES:. 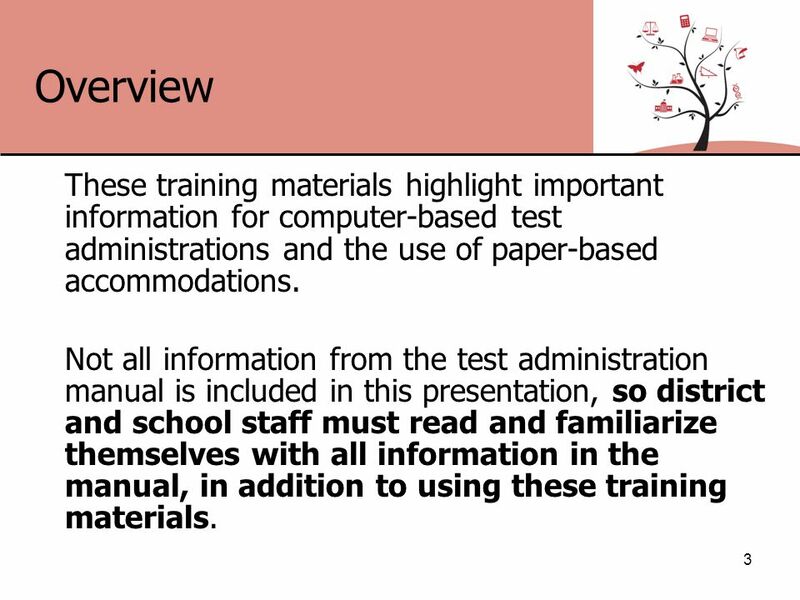 PROGRAM OVERVIEW Insert overview from the program guide. 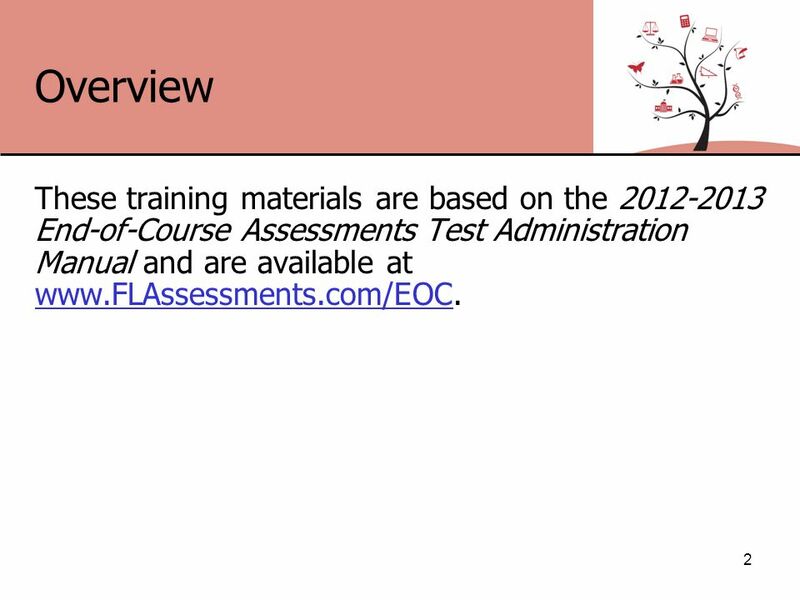 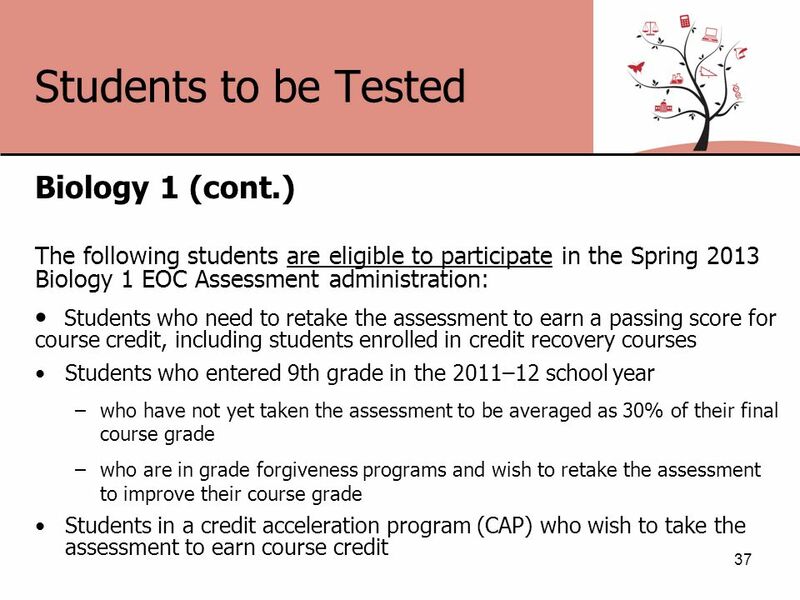 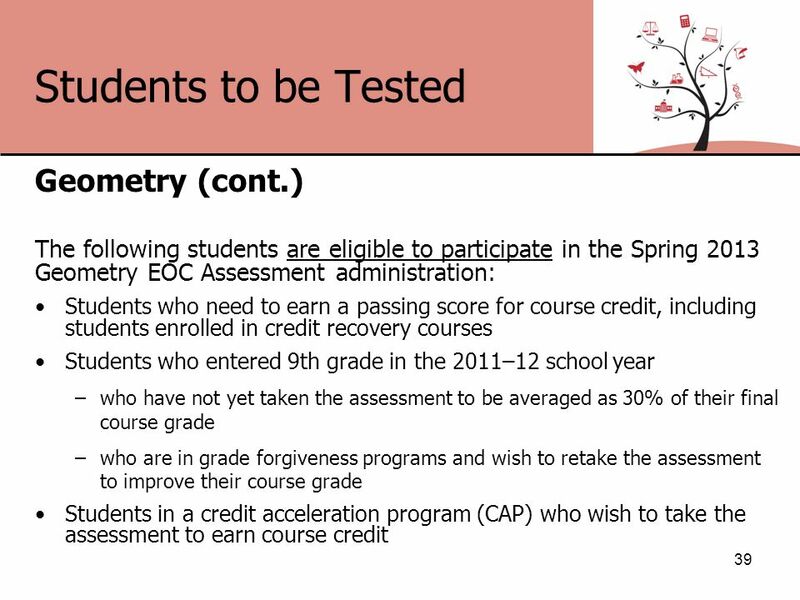 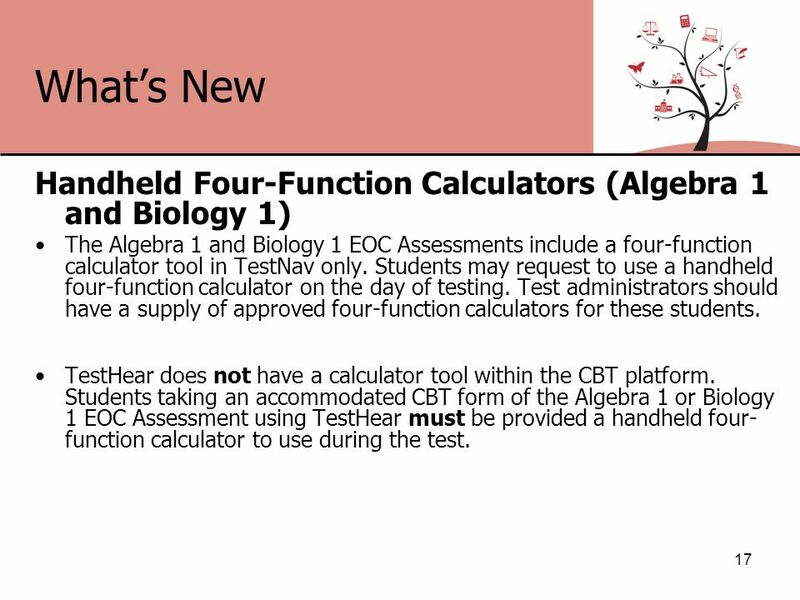 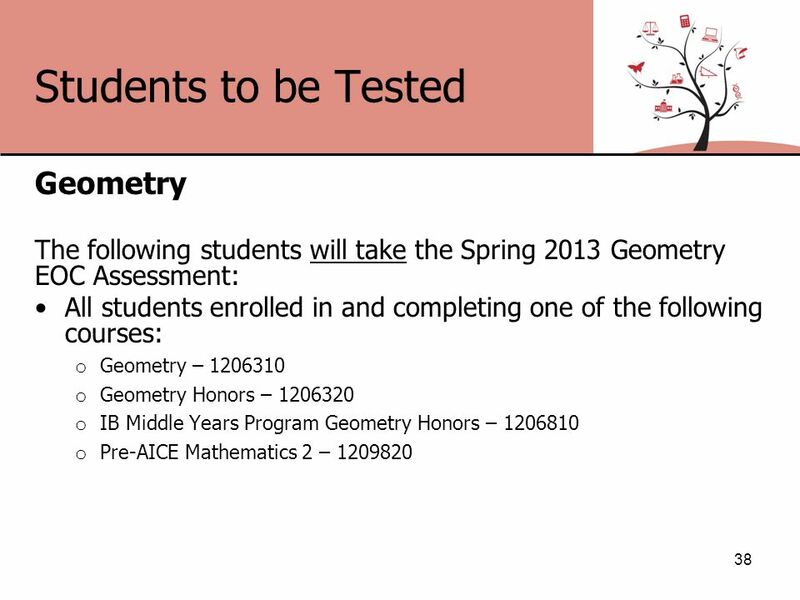 Spring 2013 End-of-Course Assessments Training Materials Technology Coordinator Algebra 1 EOC Assessment Biology 1 EOC Assessment Geometry EOC Assessment. 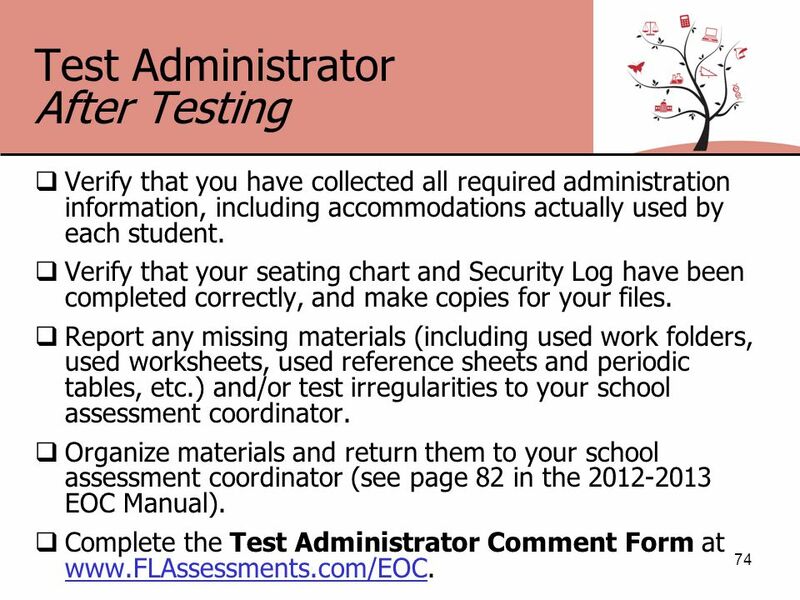 Spring 2015 Grades 5 and 8 FCAT 2.0 Science Test Coordinator Training 1. 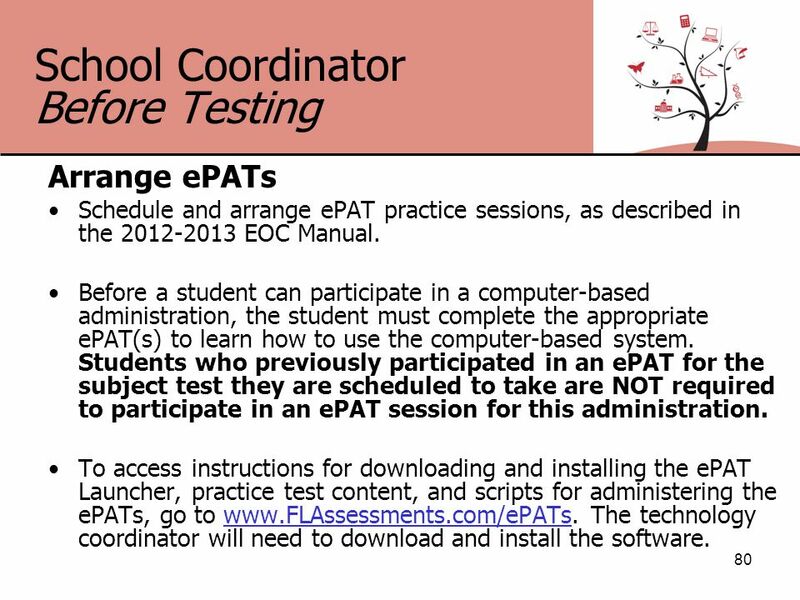 Spring 2013 RMS School Assessment Coordinator Training Spring 2013 Computer-Based Tests FCAT Mathematics Retake FCAT 2.0 Reading Retake Grade 5 FCAT 2.0. 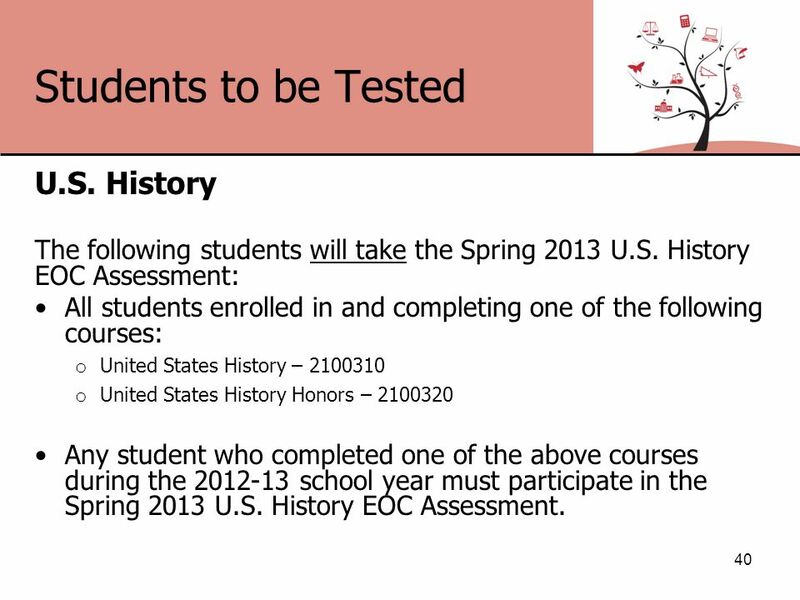 Spring 2012 End-of-Course Training Materials Algebra 1 EOC Assessment Biology 1 EOC Assessment Geometry EOC Assessment U.S. History EOC Field Test 1. 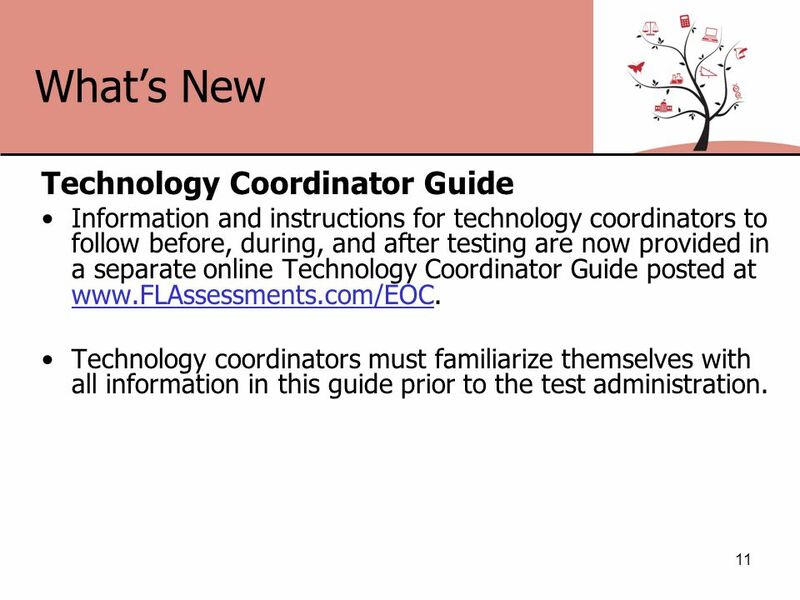 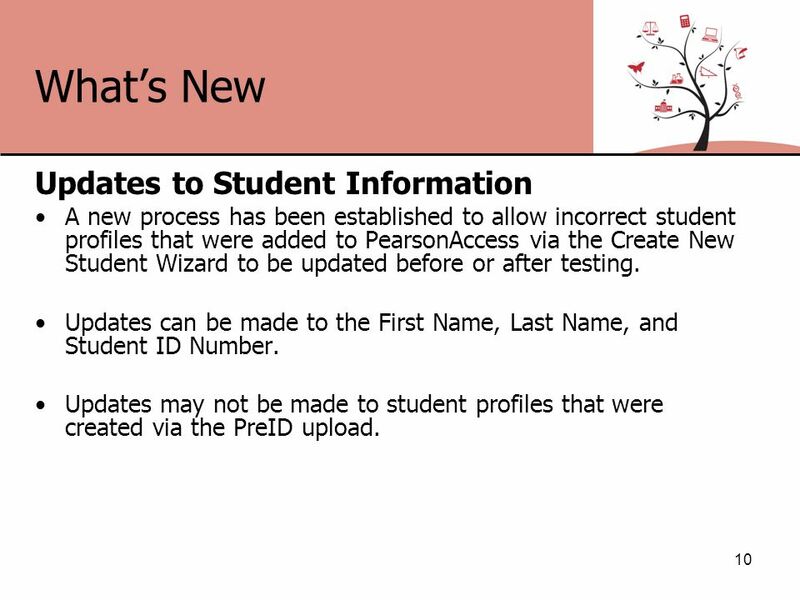 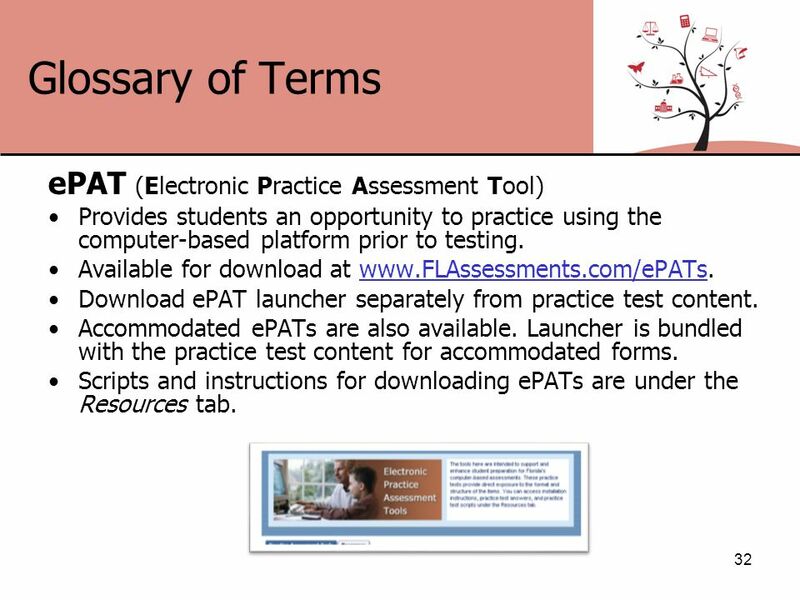 Spring 2013 Computer-Based Testing Training Materials Grades 6 & 7 FCAT 2.0 Reading Grade 5 FCAT 2.0 Mathematics 1. 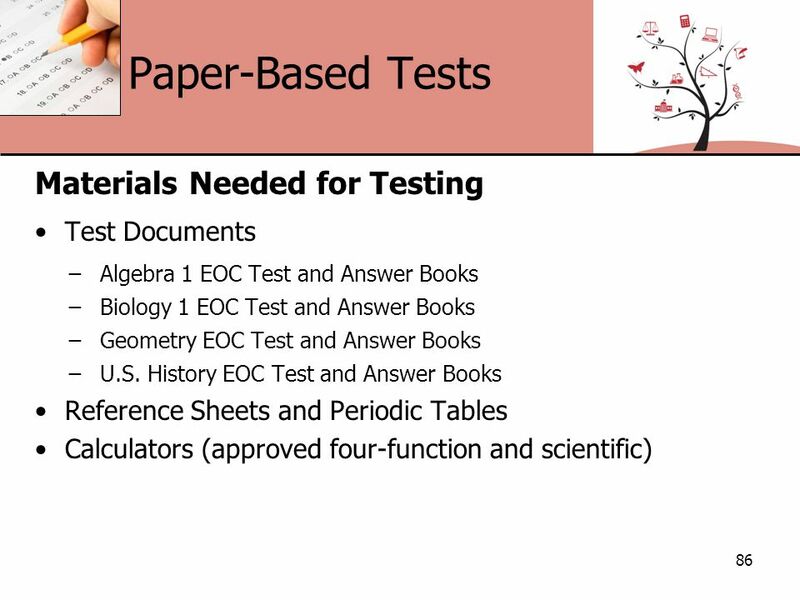 Fall 2014 Reading & Mathematics Retake Training Materials. 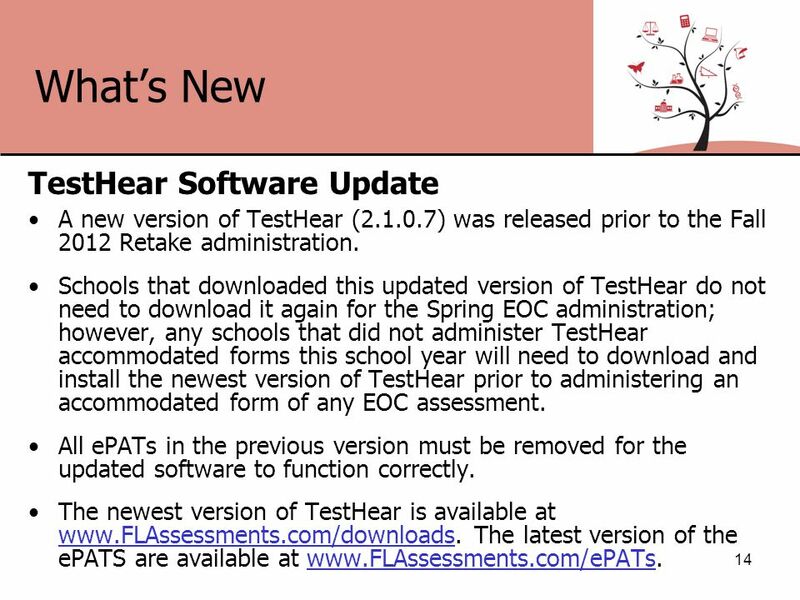 Spring 2014 Computer-Based Testing Training Materials Grades 6, 7, 8, 9, and 10 FCAT 2.0 Reading Grades 5 and 6 FCAT 2.0 Mathematics FCAT 2.0 Reading Retake.